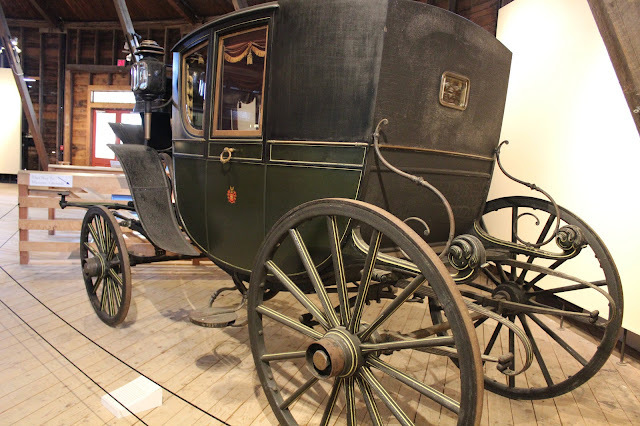 For many years I have wanted to visit the Shelburne Museum in Vermont and we arranged to go with our neighbours, Marlyse and Ian, on a fancy car drive: we in our Corvette and they in their nice maroon Mercedes-Benz SLK. 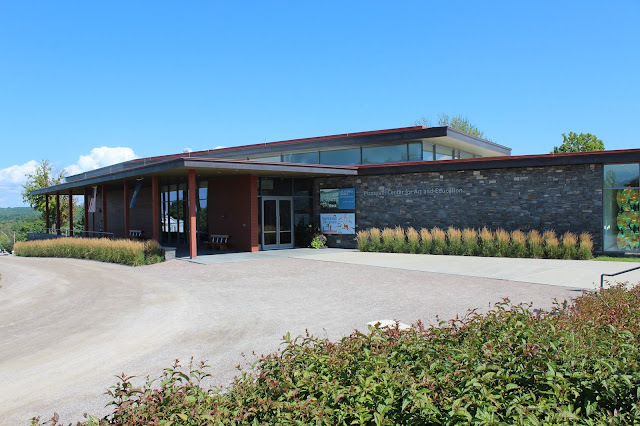 The weather looked promising and we were on the road early for the four hour drive, crossing the border into New York at Rouses Point at the tiny Customs office. Although there were only about a dozen cars ahead of us, it took a while to get through but soon we were driving across the bridge over Lake Champlain into Vermont and then turned south on Interstate 89 towards Burlington. From the Interstate, Route 7 soon took us into Shelburne, where we enjoyed a nice lunch at a busy little restaurant. 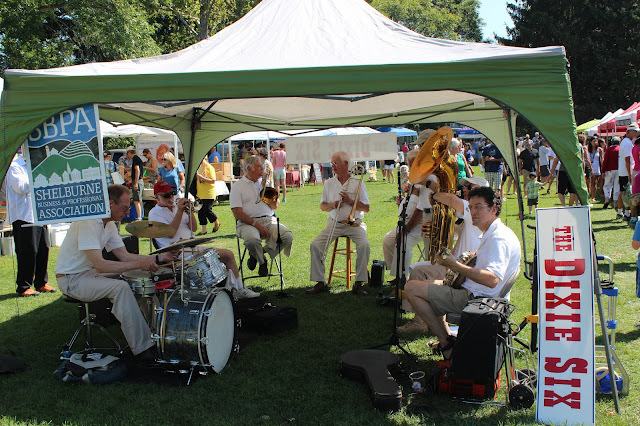 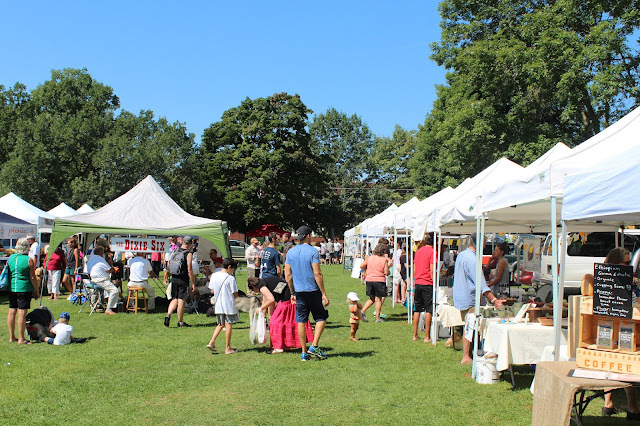 After lunch we strolled through the Saturday craft fair/market set up in a park across the street, enjoying some Dixieland music, before driving over to the Shelburne Museum itself. The Shelburne Museum, established in 1947, has been called "the Smithsonian of Vermont." 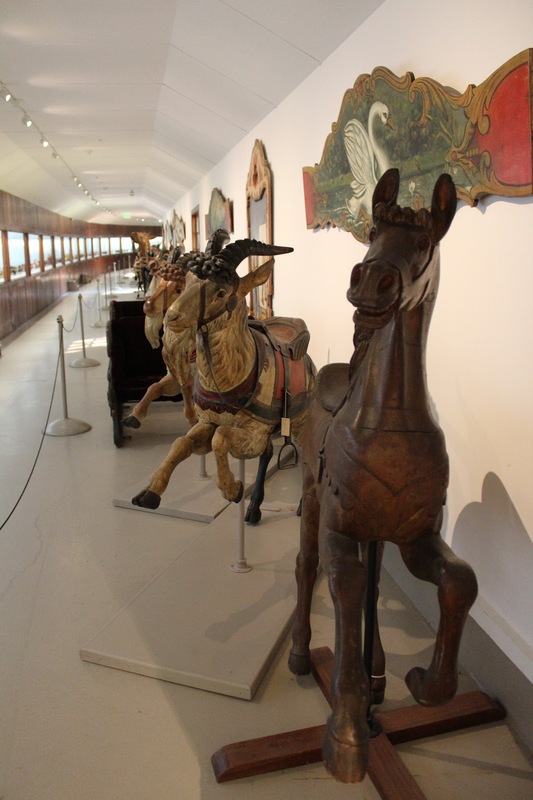 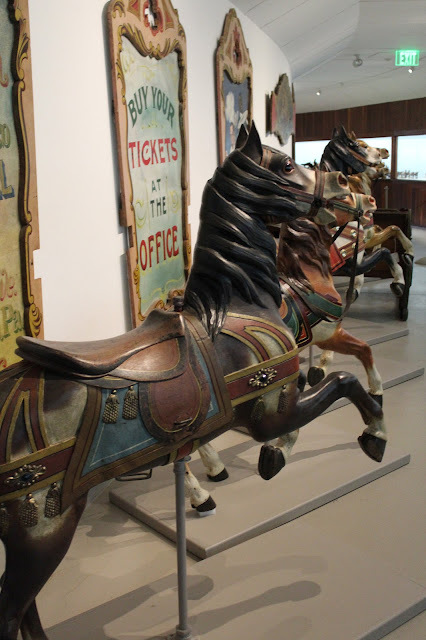 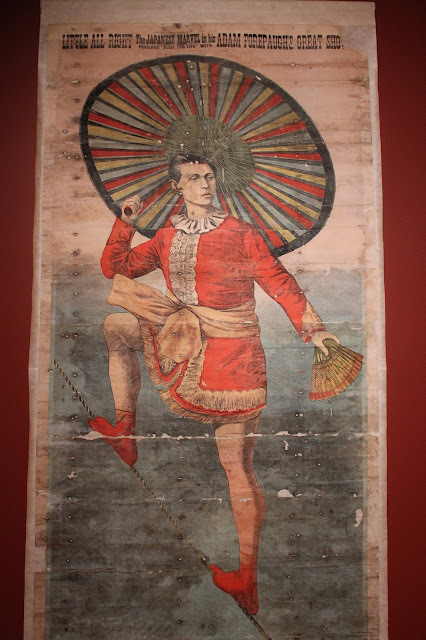 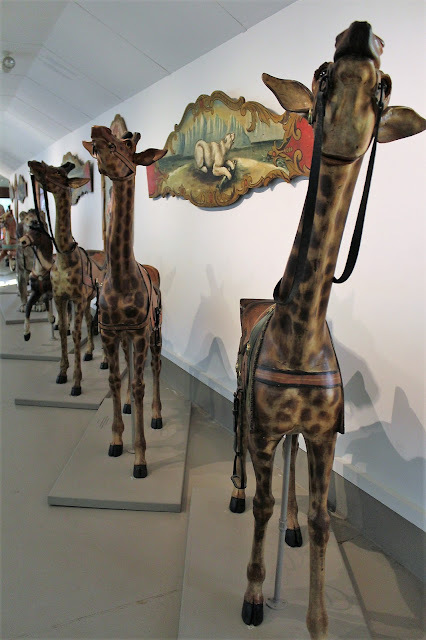 It offers an incredible collection of, well, everything, ranging from canes to musical instruments to French Impressionist paintings to circus items--in all, there are over 150,000 items housed in 39 buildings, 25 of which had been relocated to the 45 acre site. 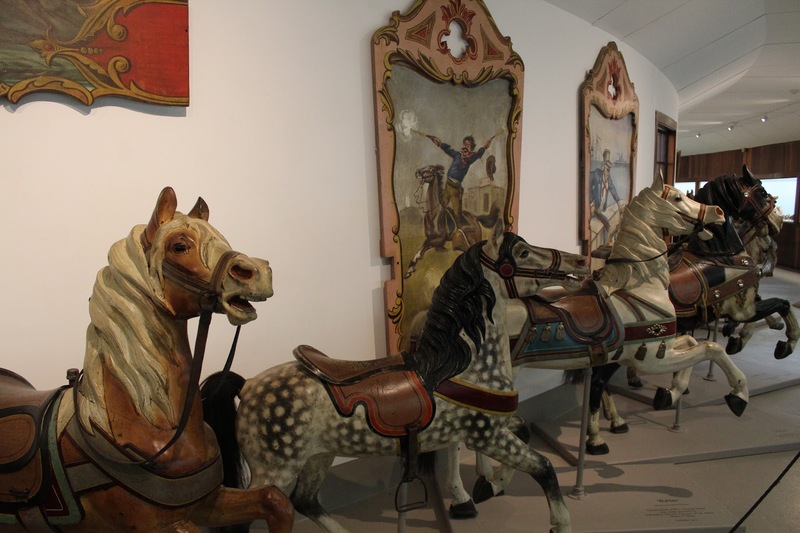 The museum was founded by Electra Havemeyer Webb, who was a pioneering collector of American folk art. Her father, from a multigenerational family of sugar refiners, built up what became known as the Sugar Trust, essentially a national monopoly of this valuable product, and became stupendously wealthy. 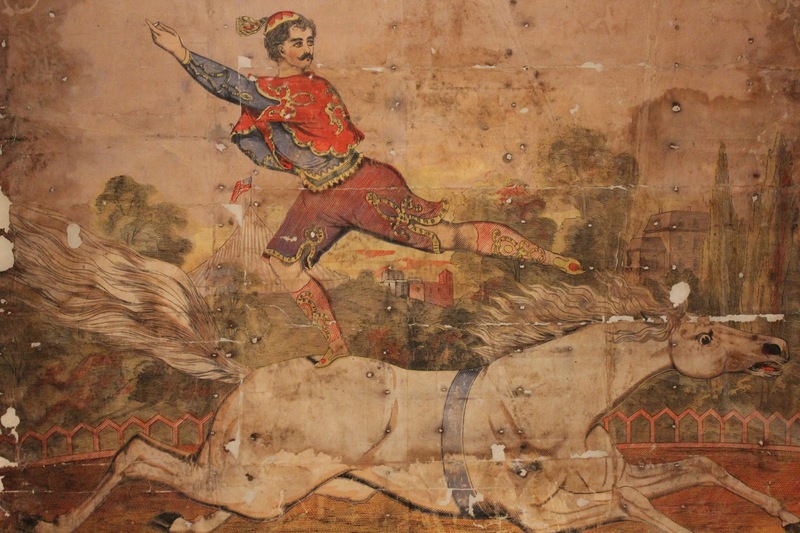 Short-tempered and difficult, he fought with his school principal and his formal schooling ended at 8. He and his wife Louisine were dedicated collectors of art, with an emphasis on the then-ignored French Impressionists. 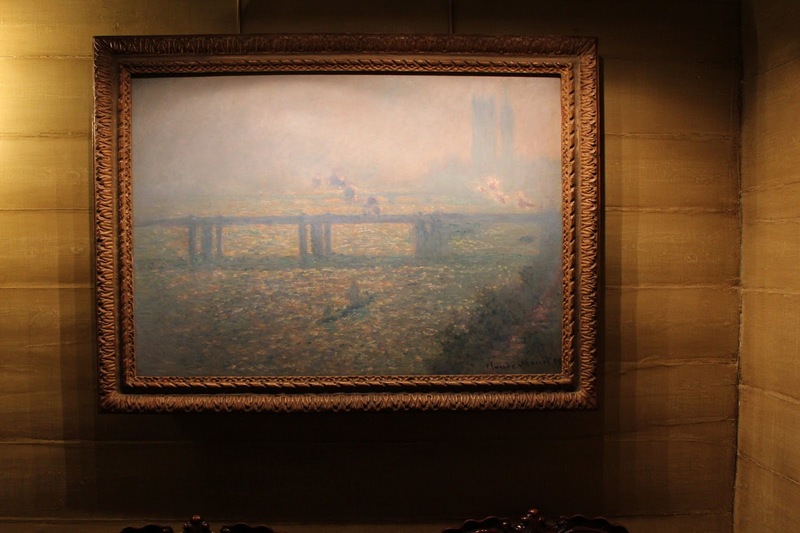 Ultimately, they would donate nearly 2,000 artworks to the Metropolitan Museum of Art in New York City. 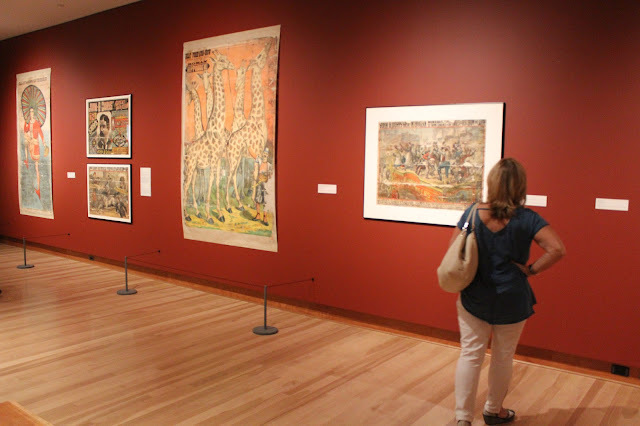 Mrs. Webb, whose husband was a Vanderbilt relation, followed a more radical path and collected quilts, duck decoys, weather vanes, advertising signs and horse-drawn vehicles. Her serious collecting of Americana began around 1911, predating Colonial Williamsburg or Greenfield Village. 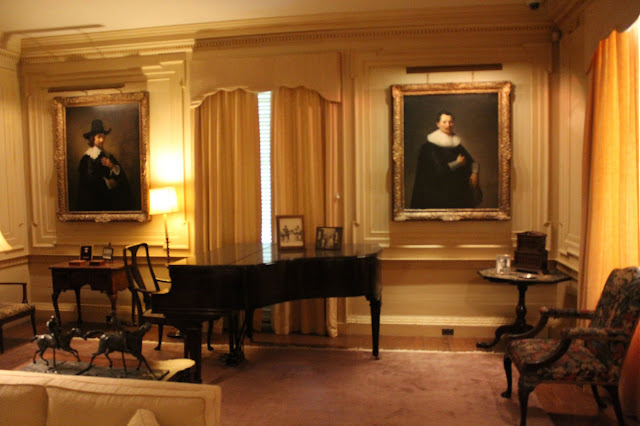 Henry Francis Dupont was encouraged by Mrs. Webb to start his own collection that would eventually become the Winterthur Museum. 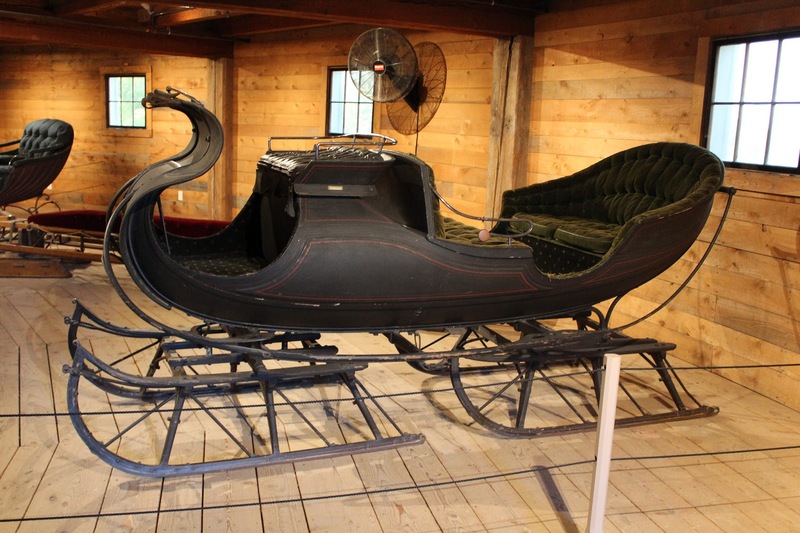 Her home in Shelburne, located 2 miles from the museum, has been restored and decorated as it would have been in her time. 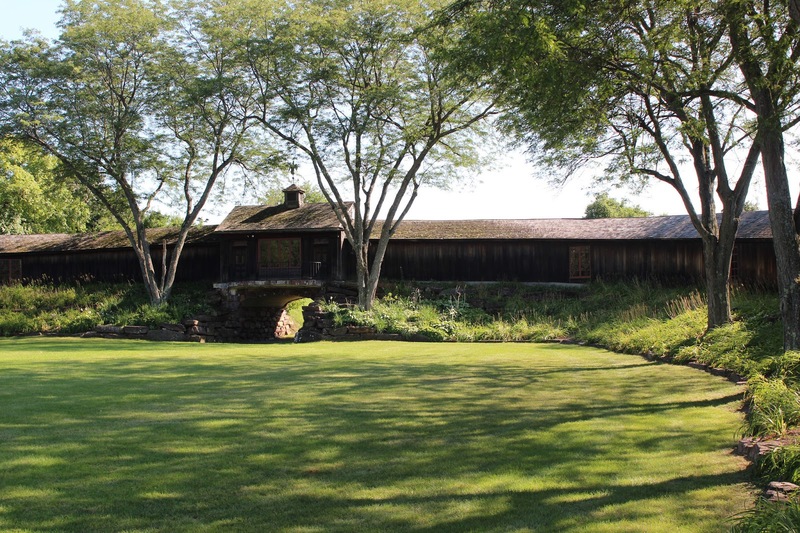 However, sale of another house in Long Island meant she needed somewhere to put all her cigar store indians and decorative art, so in 1947 she corralled some friends and the Shelburne Museum began. 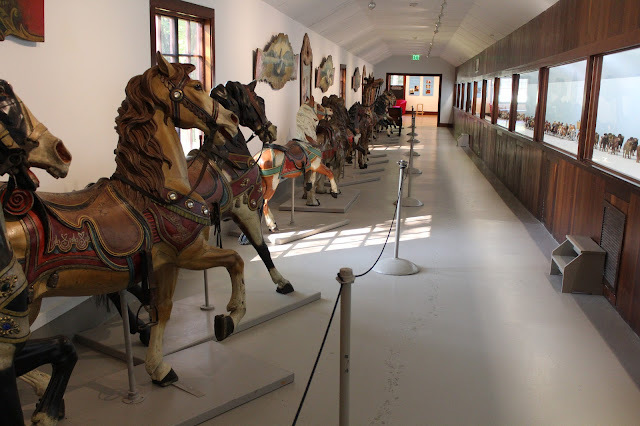 It is considered to have one of the finest collections of America. 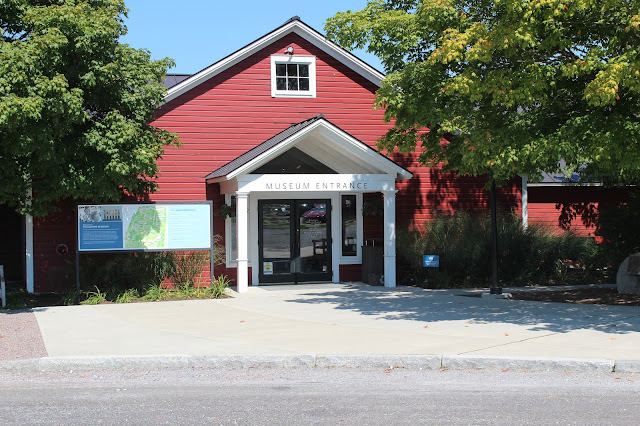 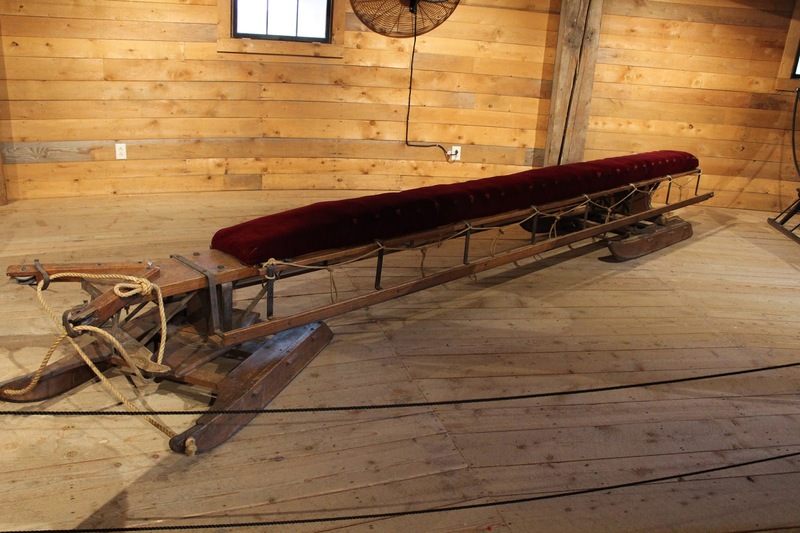 The operation of a major museum in a small town in Vermont is clearly not easy. In 1996, the museum sold some of its artworks for $30 million to raise funds to continue operations over the long term. 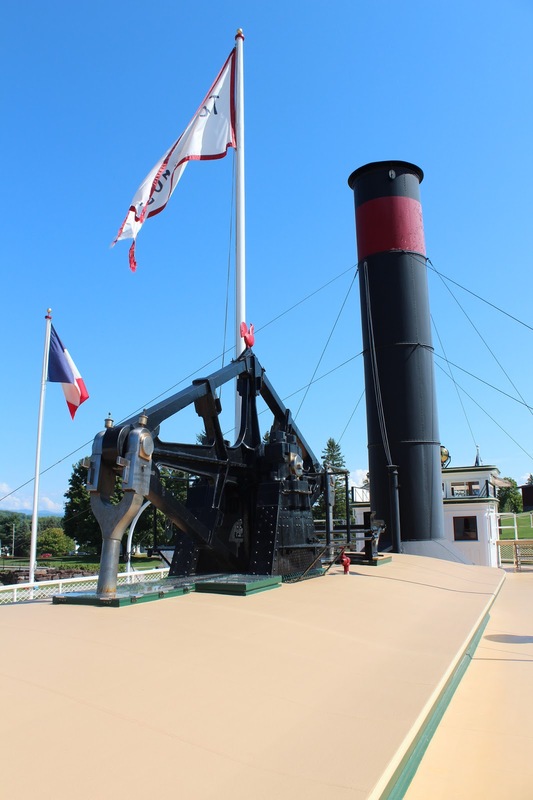 It was a beautiful summer day and we were drawn to some of the outdoor exhibits. 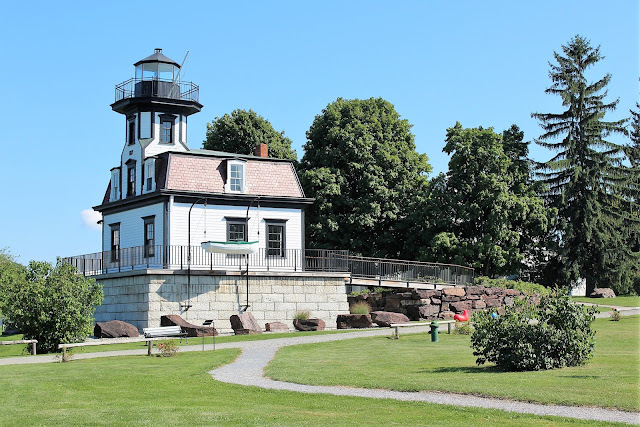 Walking through the finely landscaped grounds, we passed a charming Second Empire-style lighthouse, which had once faced Lake Champlain on Colchester Reef (now renamed Sunset Island) and operated from 1871 until 1933. 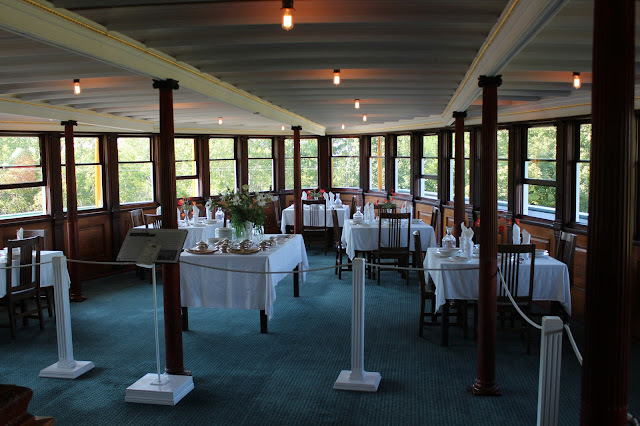 The island was sold in 1956 and the derelict lighthouse was sold for $50 for timber but Mrs. Webb rescued it and had it rebuilt at the museum. 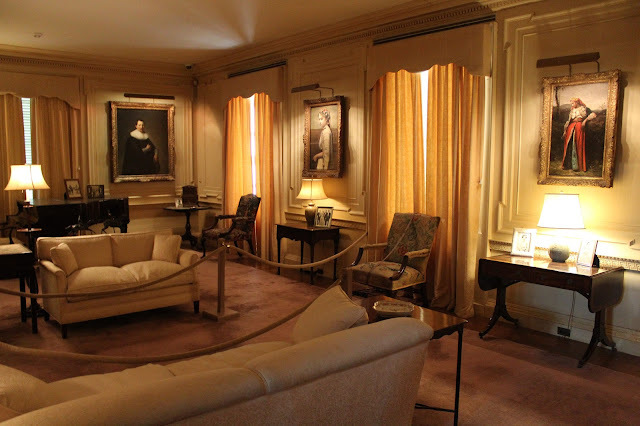 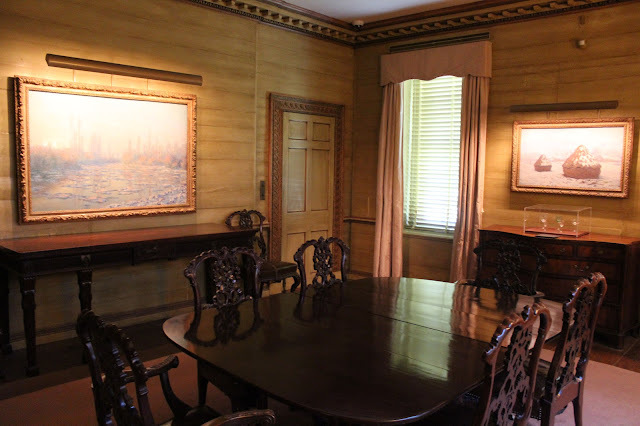 It now houses some of the American furniture from the Shelburne collection. 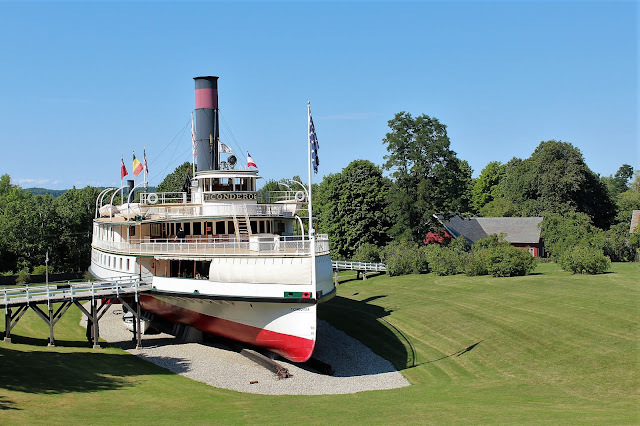 And close to the lighthouse one finds one of Shelburne's most remarkable treasures: a 220 foot long Lake Champlain steamboat, the SS Ticonderoga. 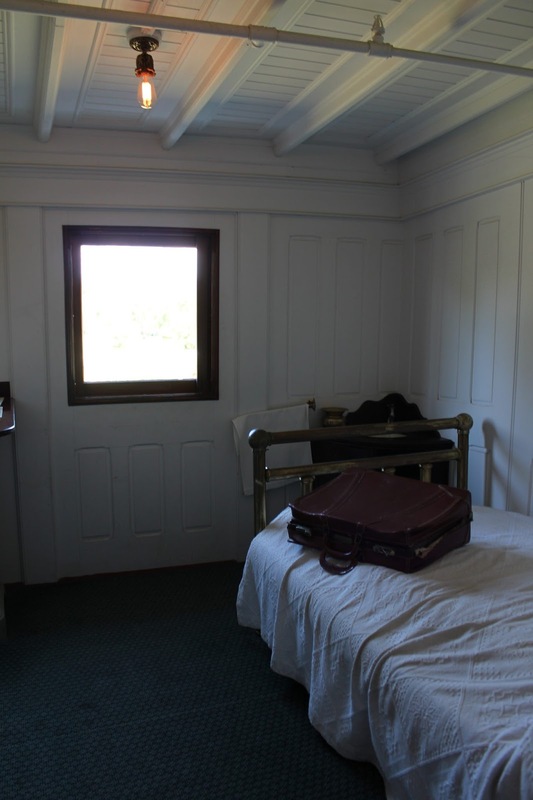 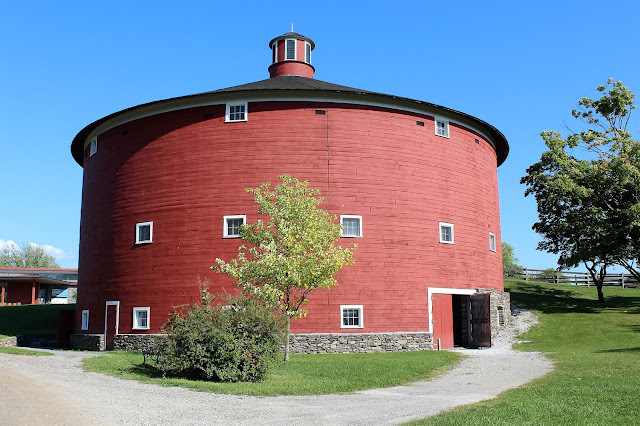 It was declared a National Historic Landmark in 1964. Here is a detailed description of this superb ship from (of all places) the November/December 1980 issue of "Farm Collector:"
The Ticonderoga is the last remaining example of the type of North America side wheel steamboat that carried our westward expansion in the decades before the railroads. 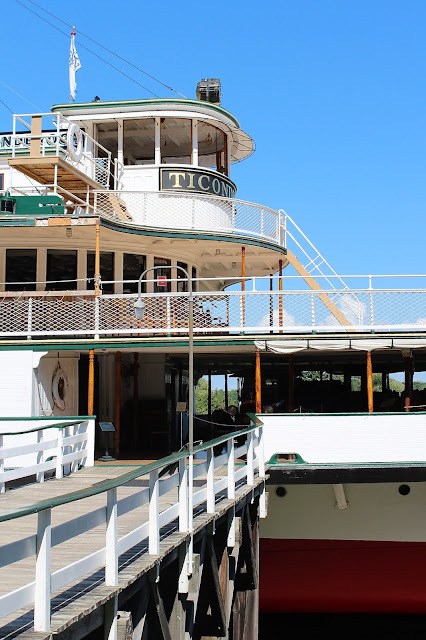 Except for her enclosed wheel-houses, an early 20th century development, the Ticonderoga is identical in design and propulsion system to the vessels that served every seaboard and inland port in the United States (except on the Mississippi River system) from the late 1830s to World War II. 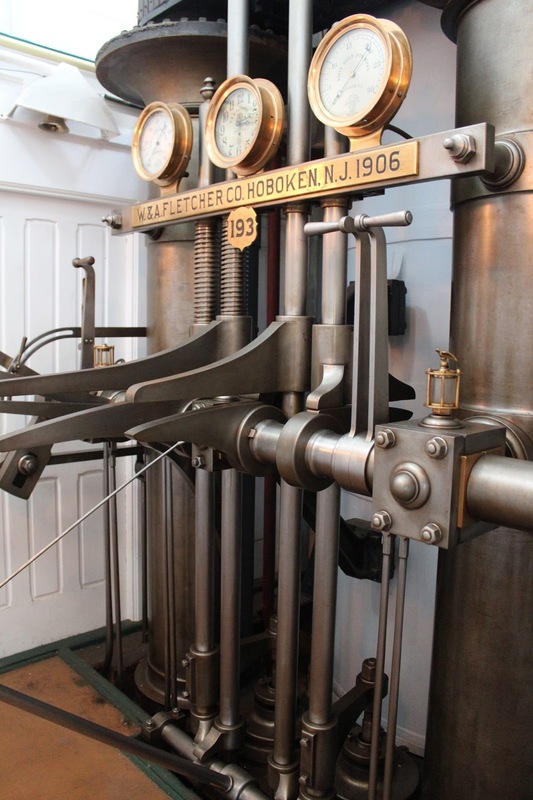 Her motive power is a vertical beam engine, an American marine adaptation of the Newcomen engine first used for pumping water out of English coal mines. 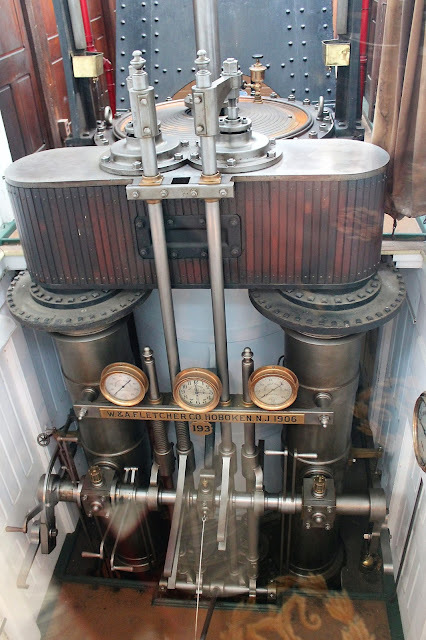 This type of propulsion system led to a distinctly American development in marine architecture: the engine rose several decks through an ellipse, allowing commodious passenger accommodations and substantial freight capacities. 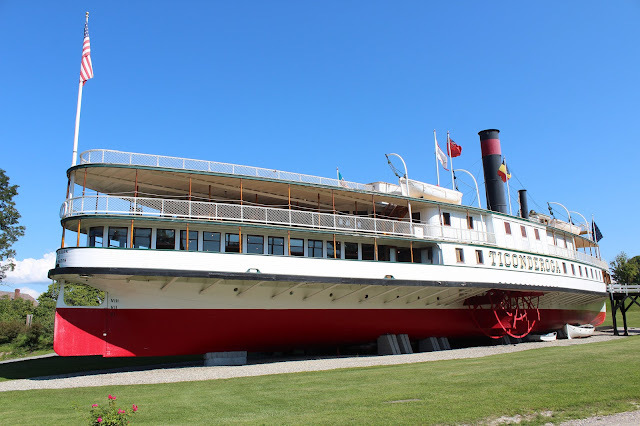 At the same time, great ease of handling and navigation in shallow waters was made possible by the side paddlewheels. 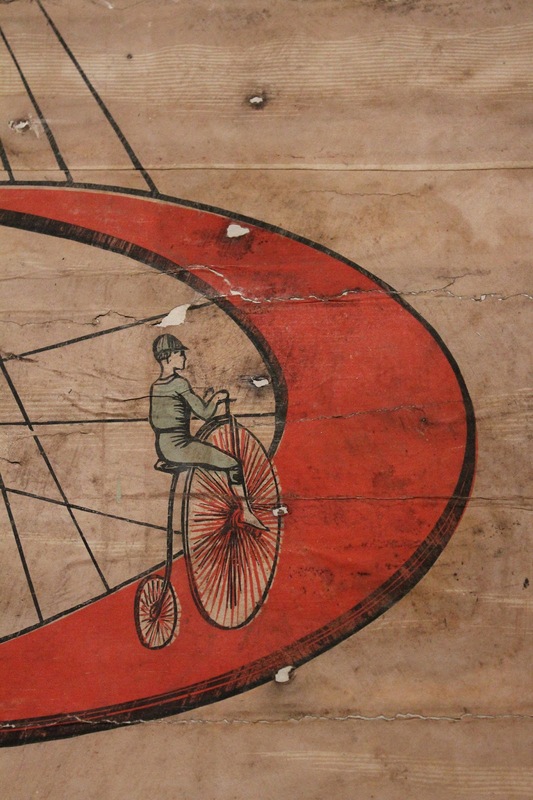 In their heyday in the 19th century, side-wheelers were ubiquitous. 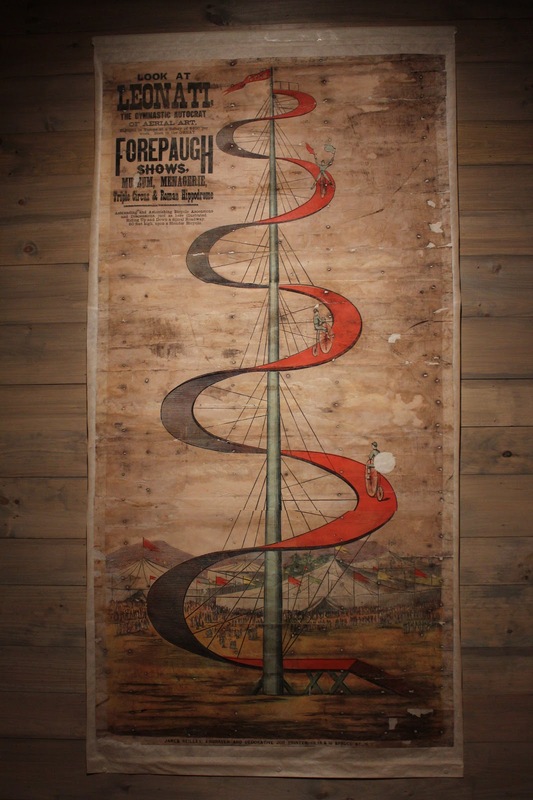 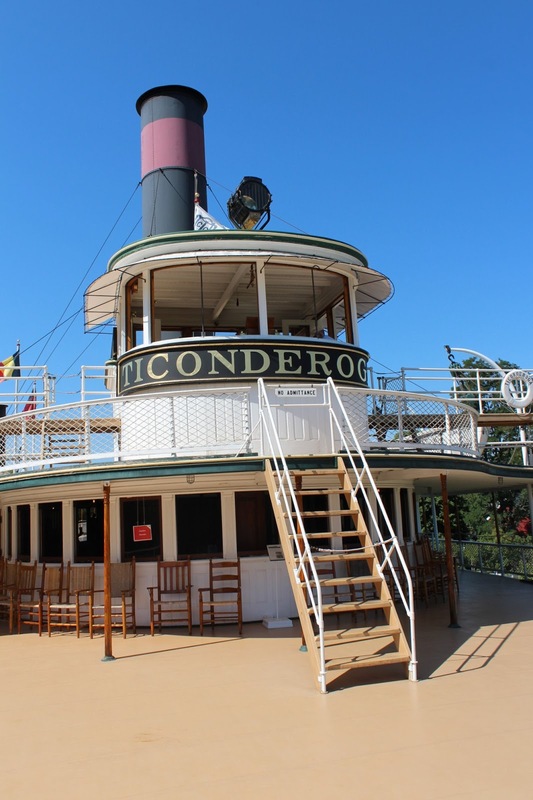 The paddlewheel era is one of the most exuberant and colorful in American history. Powered by two boilers which consumed a ton of coal an hour, the Ti was capable of speeds from 18 to 23 miles per hour. 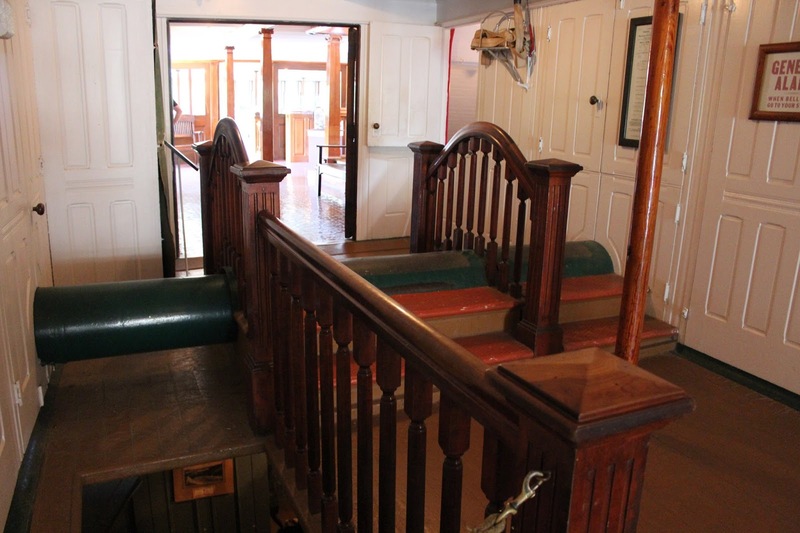 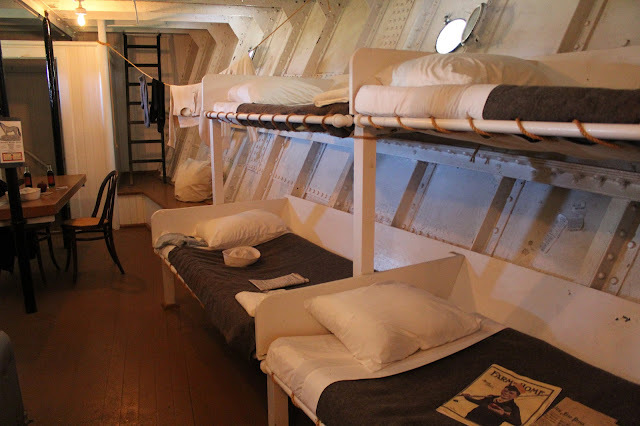 Paddlewheels on either side of the boat were driven by the unencased engine which rises through all three decks. 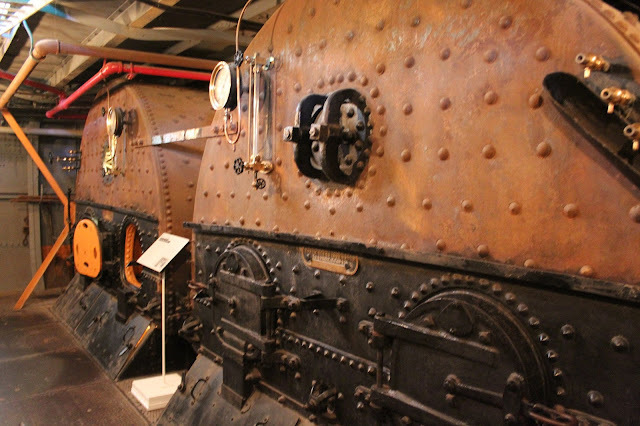 Firemen in the boiler-room shoveled coal to heat two enormous boilers containing thousands of gallons of water. 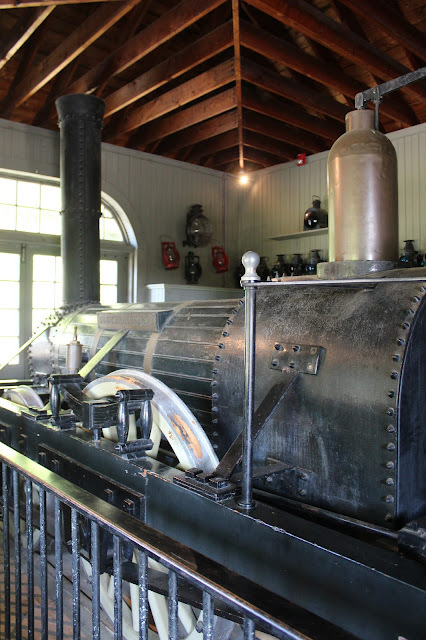 The steam pressure thus generated rose into the steam chest from which it could be released by the engineer into the 53-inch piston cylinder. The piston's upward motion pushed on the walking beam connected to the Pitman arm which in turn rotated the shaft holding the two wheels. The wheels themselves are of the 'feather wheel' type and were designed so that the ten buckets on each wheel entered and left the water straight. 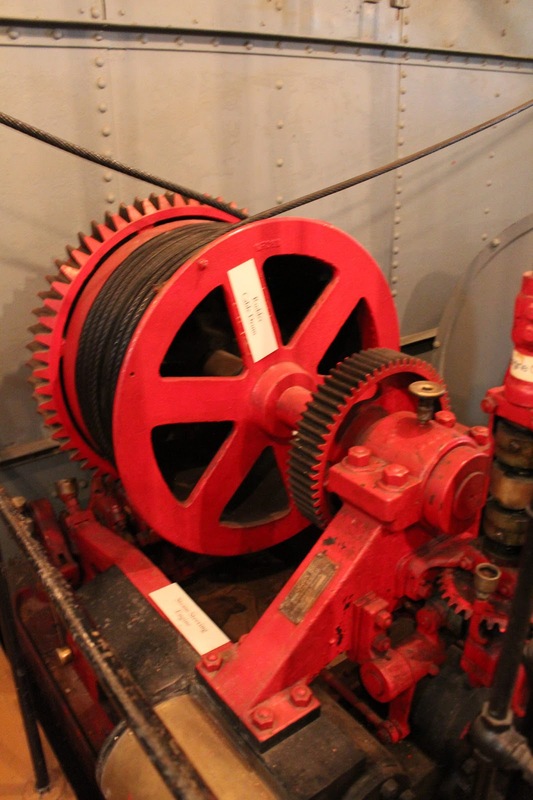 Thus engine power was not wasted lifting the tons of water displaced. 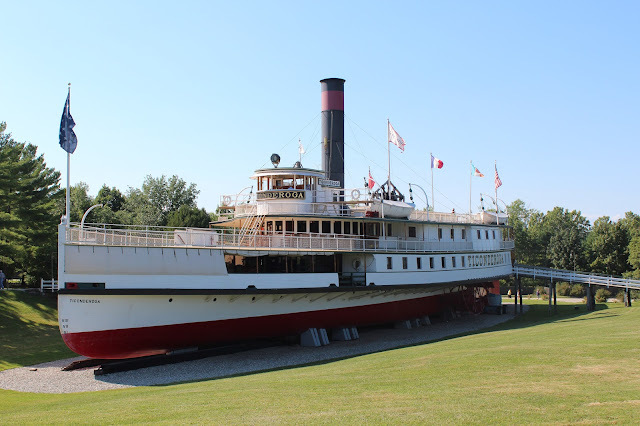 Designed for the luxury tourist lake trade, and used mainly for excursions, the Ticonderoga also carried freight such as apples, cars, and livestock and had roomy overnight passenger accommodations. She once carried an elephant across Lake Champlain. 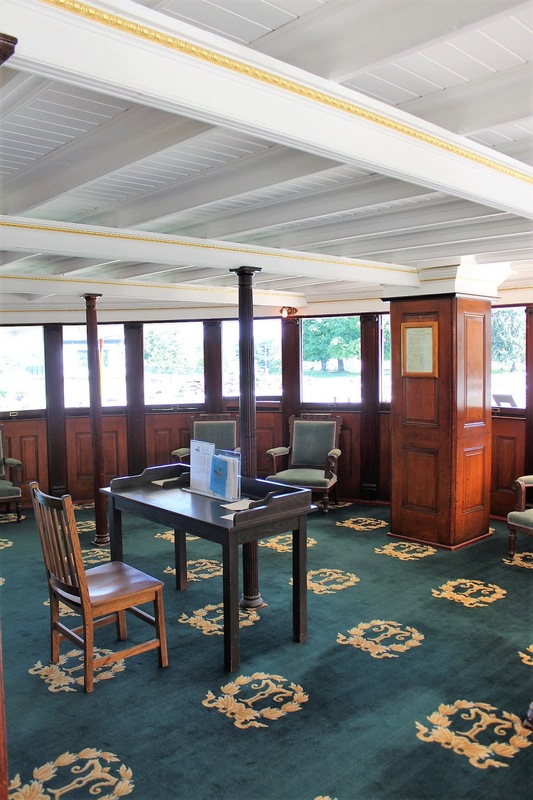 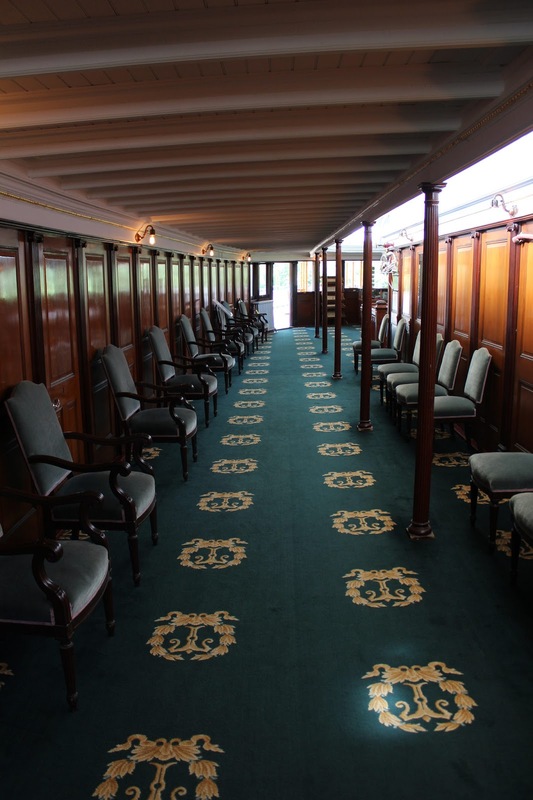 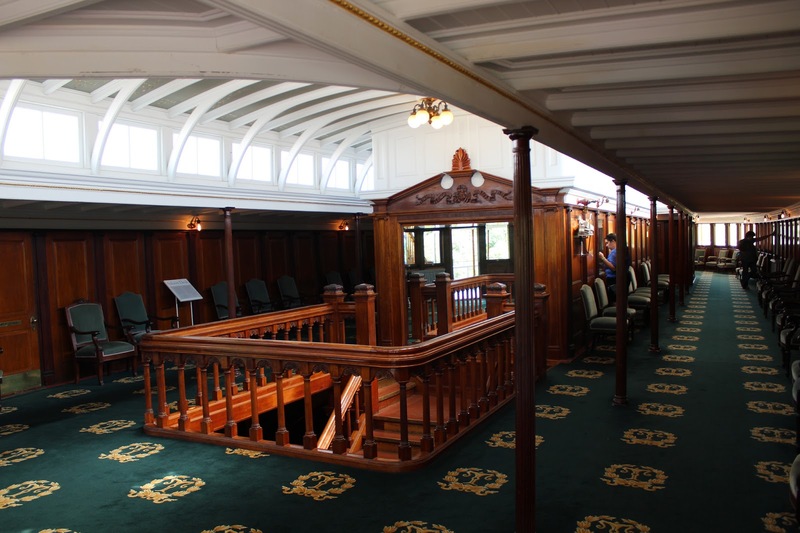 The Ti's interior shows the elegance of the grand tradition of American steamship building in the butternut and cherry paneling of its dining room and stateroom hall, its gold stenciled ceilings and its wide and lushly carpeted staircases. The last vessel built by the Champlain Transportation Company, the 220 foot Ticonderoga had served 43 years when, in 1950 she was about to be scrapped. 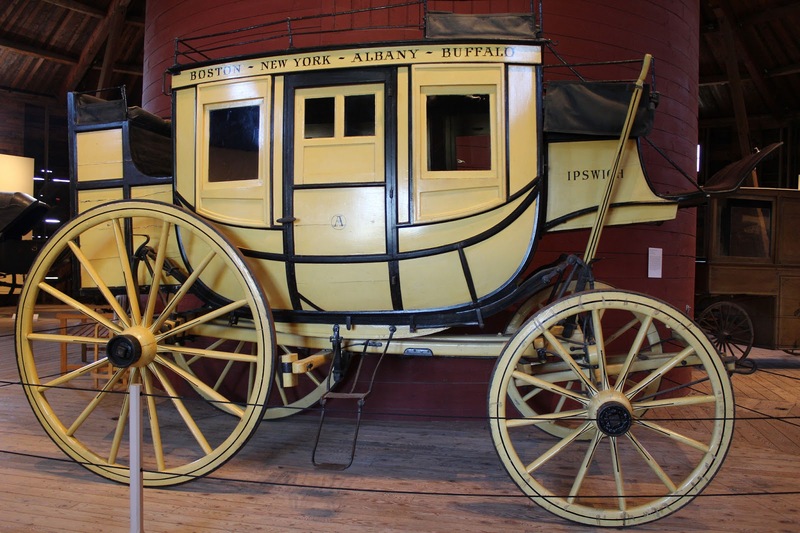 A public fund-raising campaign enabled her to return to operation that year. Early in 1951 she was purchased by the Shelburne Museum which, through a subsidiary, the Shelburne Steamboat Company, kept her in operation through 1953, when trouble with her aging coal-fired, Scotch-type boilers and lack of qualified licensed personnel forced her retirement. 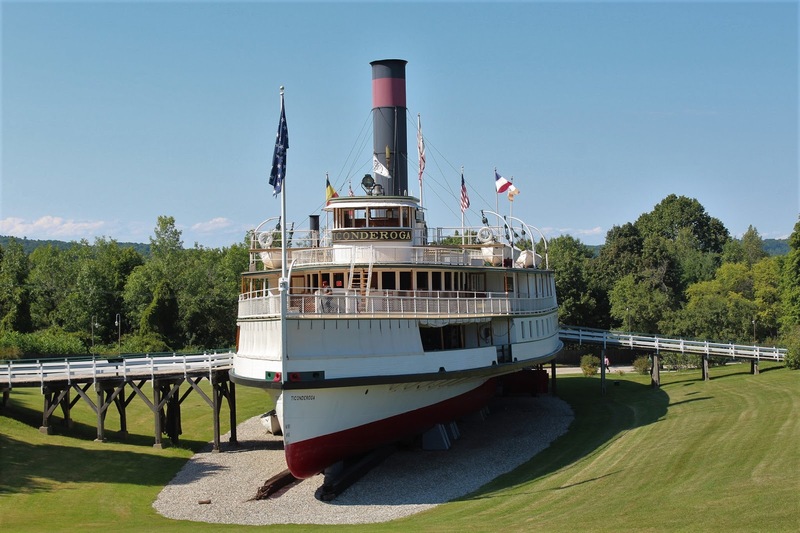 In 1954 it was decided to haul the Ticonderoga ashore as a museum exhibit and this was done by putting the ship in a basin of water where a railway carriage had been set. 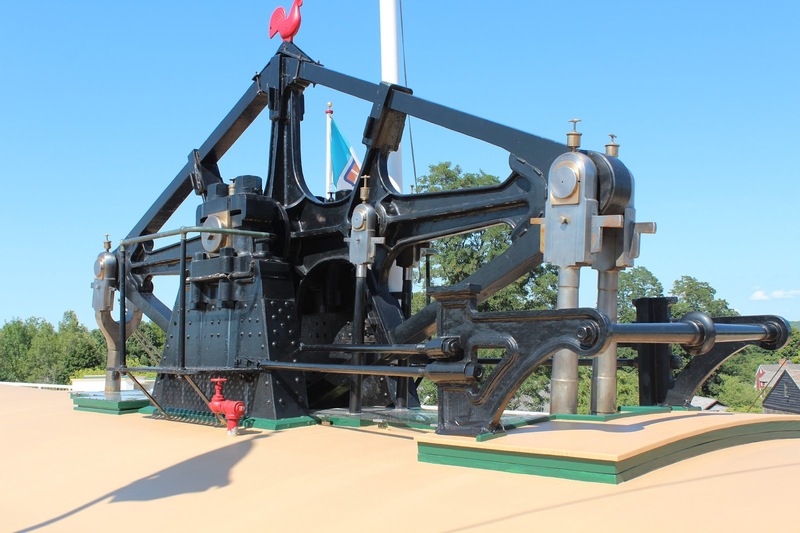 It was then carefully brought up on specially laid railway tracks to its present position, a process that took two months and is shown on a video on board the ship. 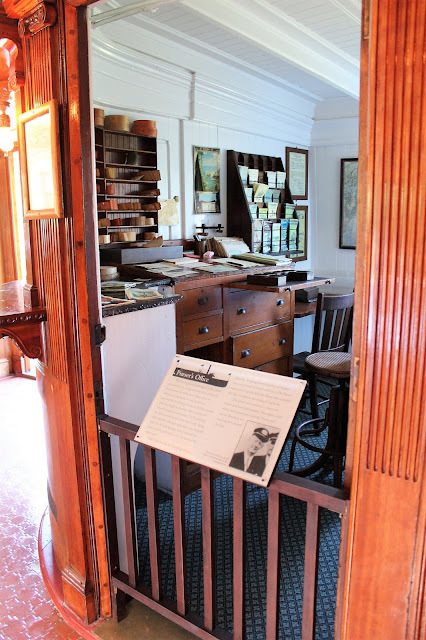 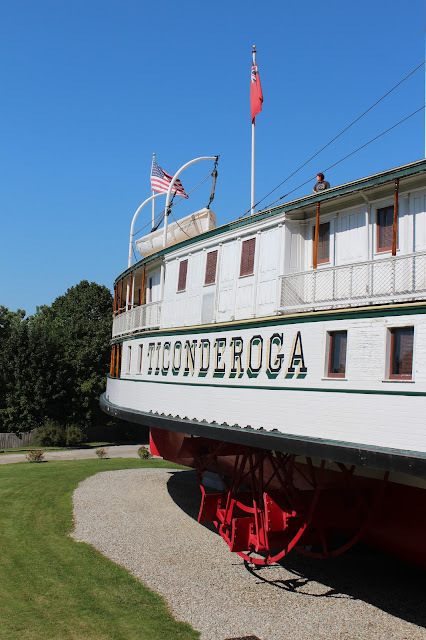 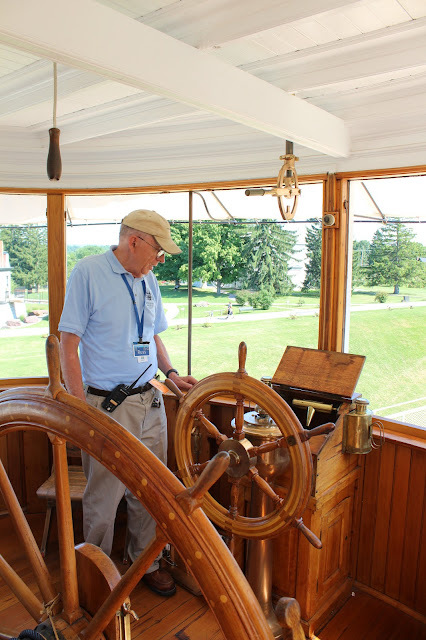 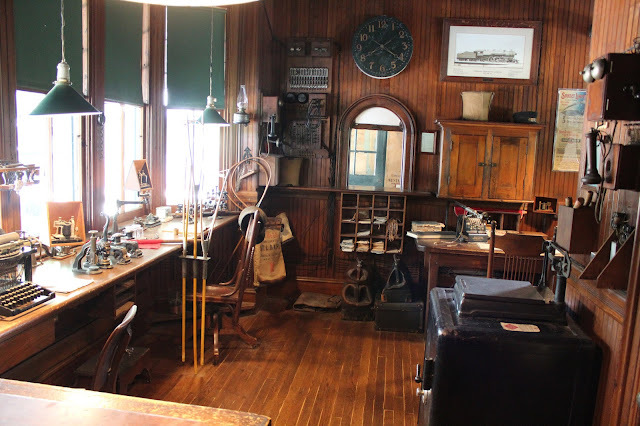 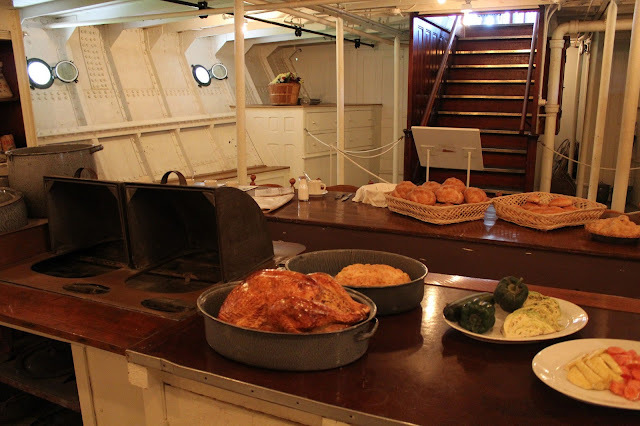 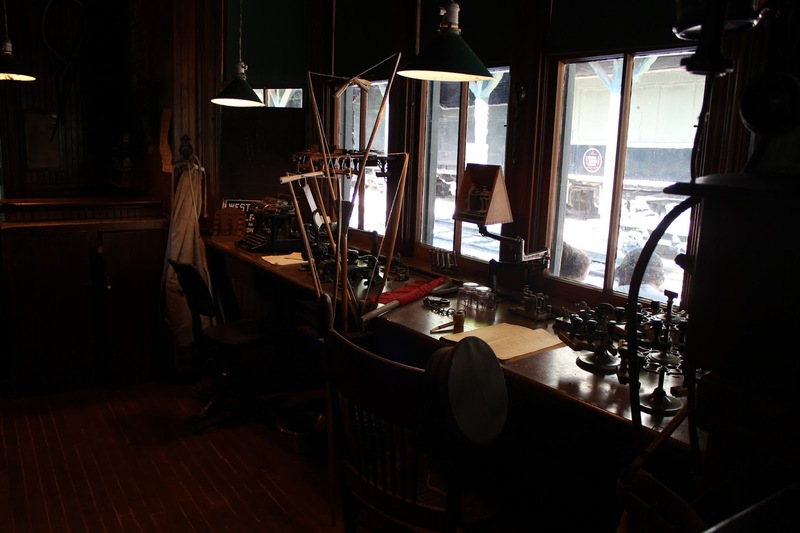 Subsequently, it was decided that more than simple maintenance was required and starting in 1977 the Ticonderoga underwent a complete restoration, bringing it to the immaculate condition visitors enjoy today. 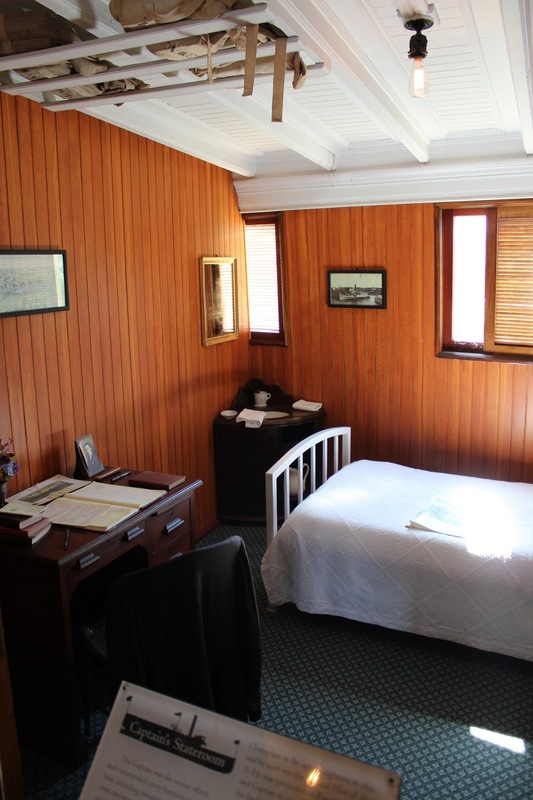 The Electra Havemeyer Webb Memorial Building was erected in 1960 by Mrs. Webb's children to honour the museum founder. 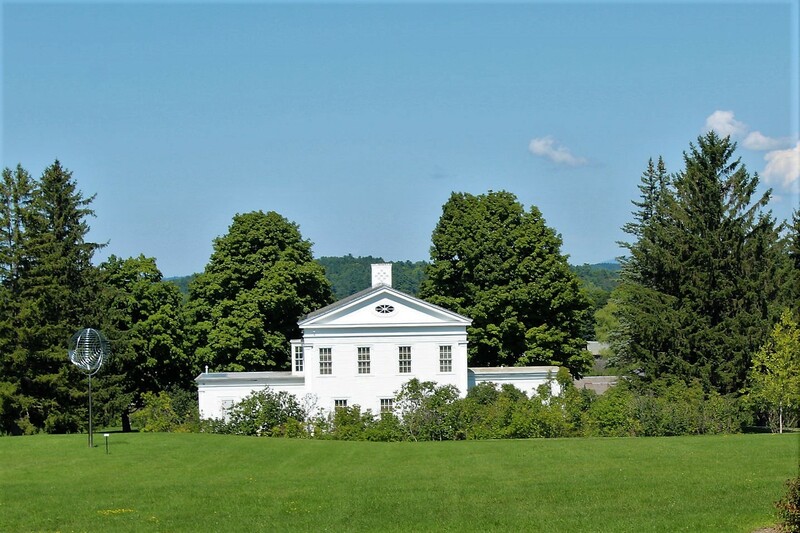 The Greek Revival structure was completed in 1967 and houses the Shelburne collection of European art, shown in six period rooms that were actually relocated from the Webbs' Park Avenue apartment in New York City. 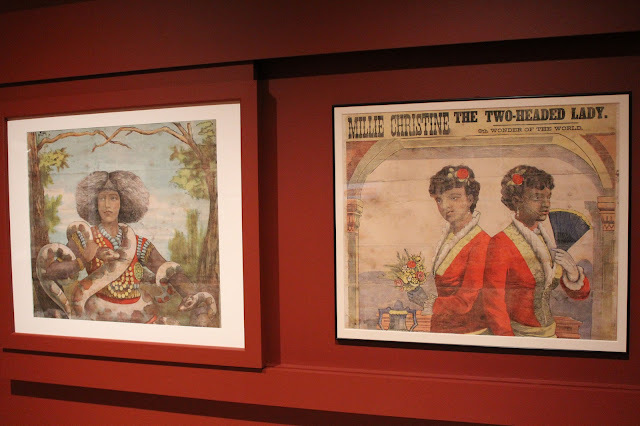 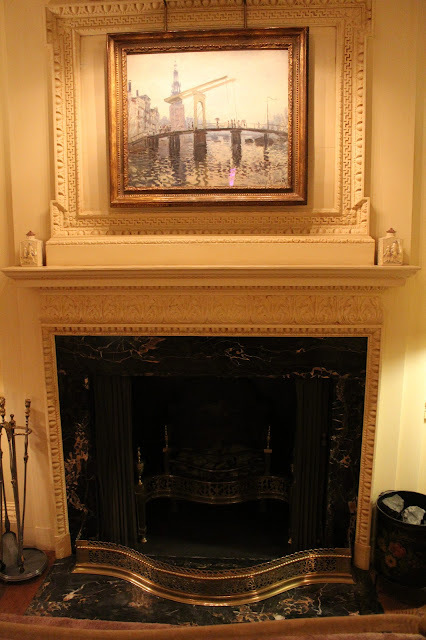 Artists represented in the collection include Rembrand, Degas, Monet, Manet, as well as family friend Mary Cassatt, who painted a dual portrait of Mrs. Webb and her mother. Passing by an operational vintage carousel, one comes to yet another remarkable sight: the Circus Building. 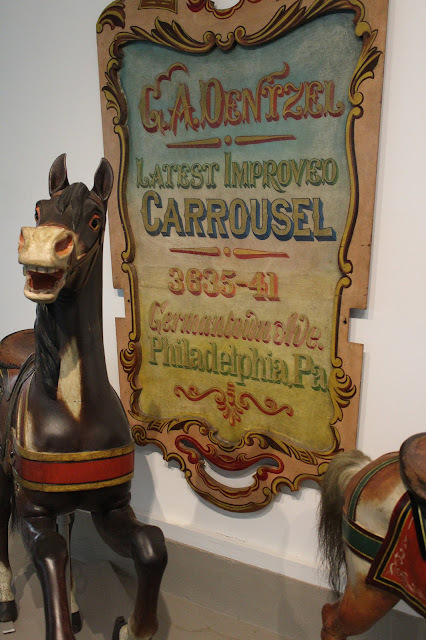 Conceived in the 1950s and constructed in 1965, this horseshoe-shaped building is 518 feet in length and houses circus posters, beautiful carousel animals from a 40 animal carousel built around 1902 by the Gustav Dentzel Company of Philadelphia (along with others), and three elaborate carved miniature circuses. 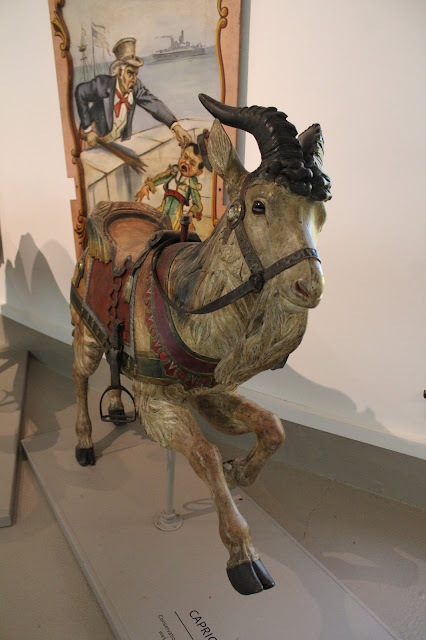 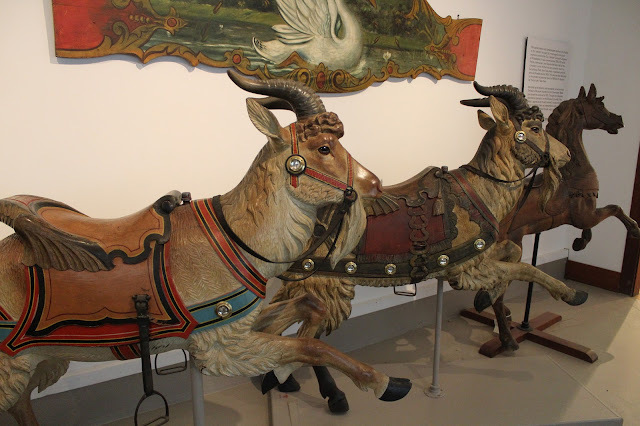 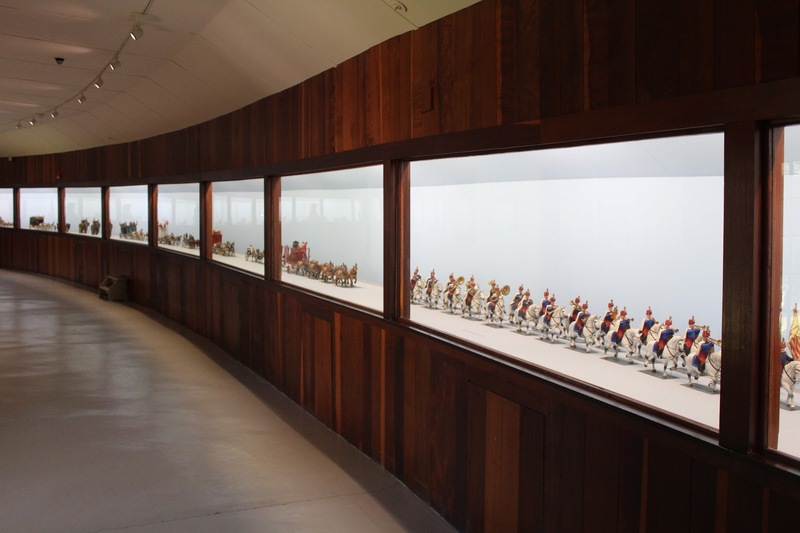 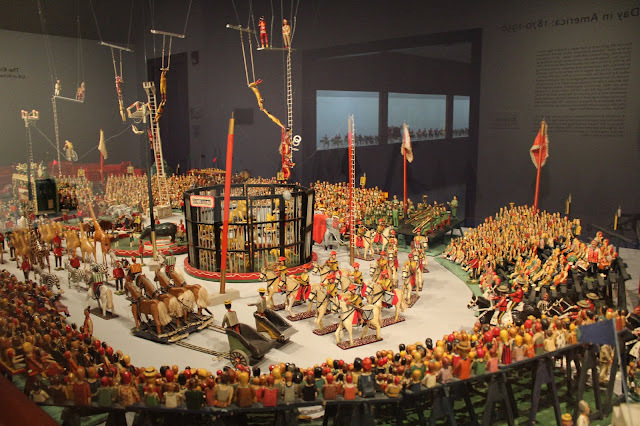 From the museum's description: "The Kirk Bros. Miniature Circus is a complete three-ringed folk art circus created by Edgar Decker Kirk (1891-1956) of Harrisburg, Pennsylvania, over a period of forty-six years. 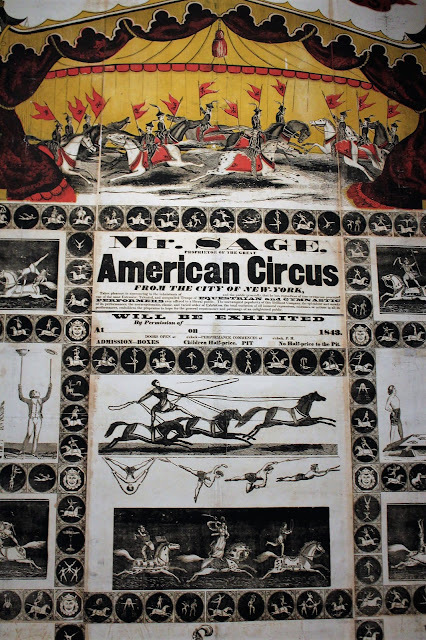 Kirk, who worked as a brakeman on the Pennsylvania railroad, began the circus in 1910 when his children were small and continued to work on it long after they were grown, until 1956. 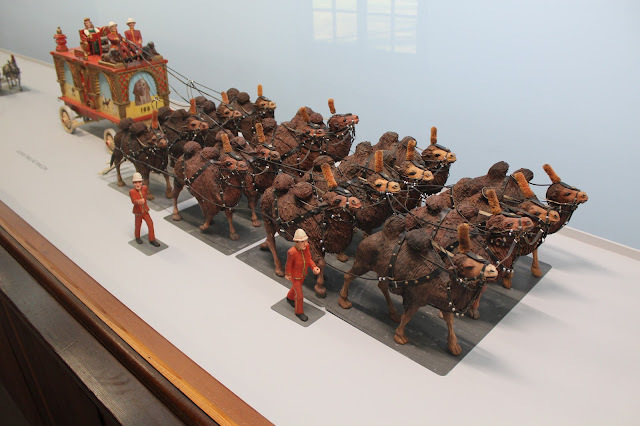 Working at night after twelve-hour days with the railroad, Kirk cut the figures for his circus from scrap lumber on a treadle-operated jigsaw and completed the carving with an ordinary penknife. Only the nails and paint were specially purchased. The Kirk circus, complete with animals acts, clowns, trapeze artists, bands, side shows and bleachers full of spectators and vendors, is a monument to Kirk’s creativity, ingenuity and lifelong passion for the circus." 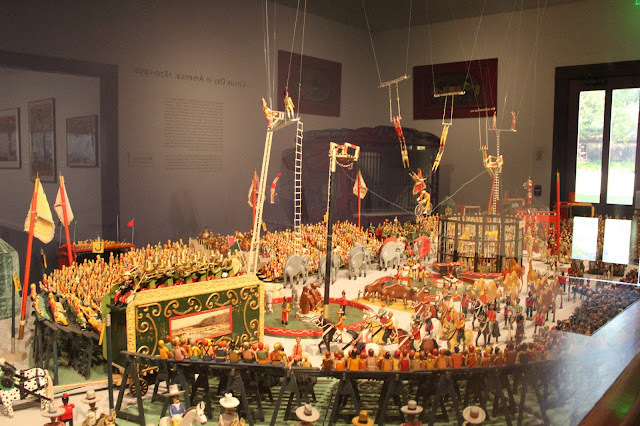 There is a miniature canal boat circus on display but the most astonishing thing in the building is the Circus Parade, which runs over 500 feet in length and was built on a one-inch to one-foot scale over a period of 30 years, beginning in 1925. Roy Arnold (1892-1976) began the project and was assisted by five other woodcarvers. 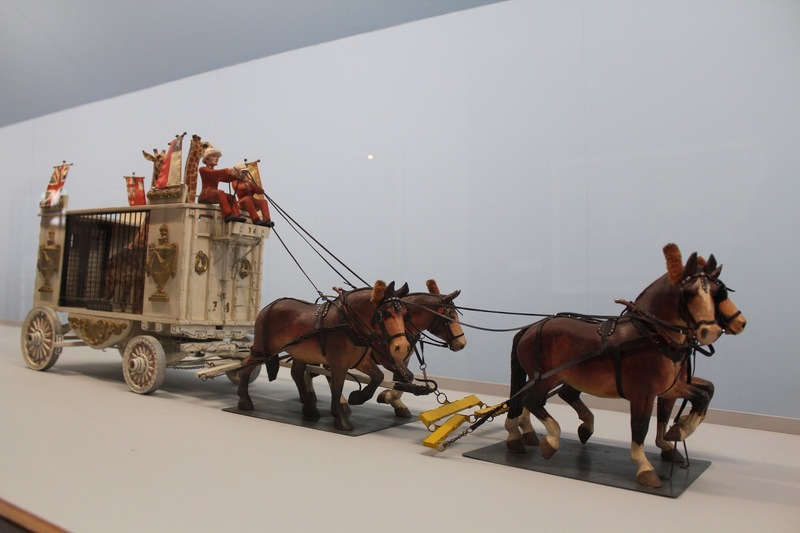 The Circus Parade represents a composite view of the Circus Parade of the art's Golden Age, with perfectly-executed wagons, animals and human figures. Working from old photographs, Mr. Arnold's creation is equivalent to a parade two miles in length. 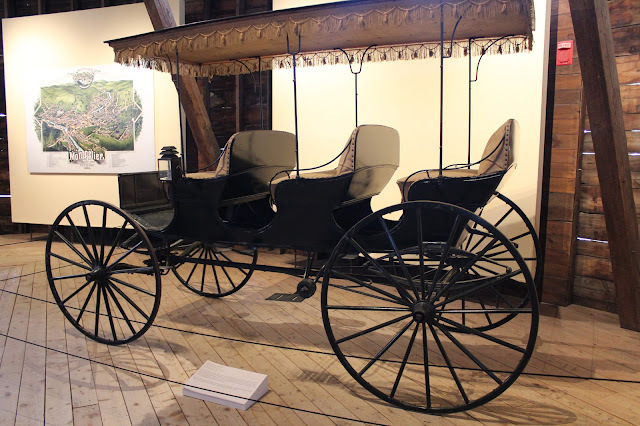 The detail is remarkable--the brakes on the wagons function and each wheel required 60 separate pieces to make. It is truly amazing. 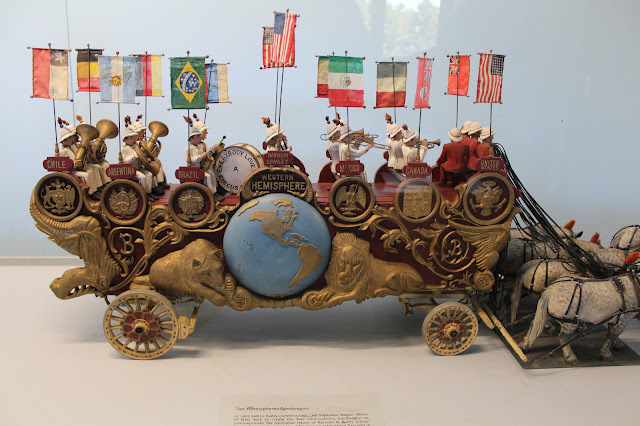 The Two Hemispheres Bandwagon, the most expensive circus wagon constructed, cost the Barnum & Bailey Circus $40,000 in 1903 ($2.4 million today). 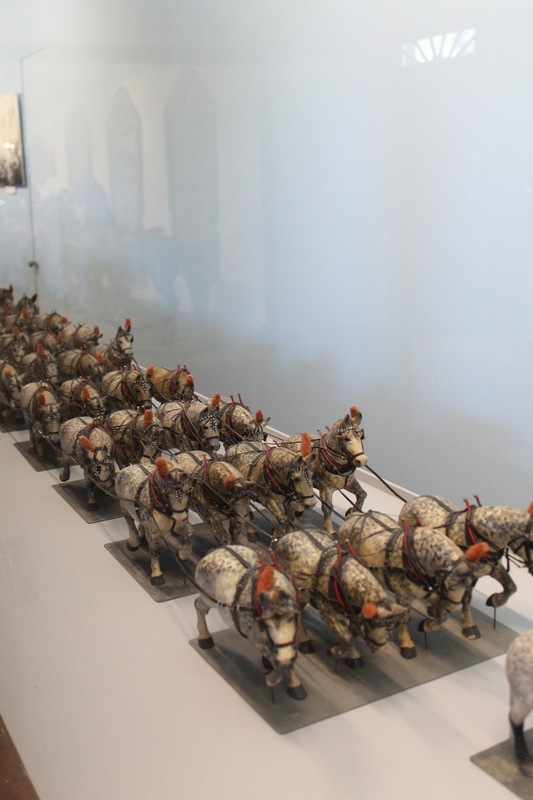 It was 10 feet tall, 8 feet wide and 28 feet long and required 40 horses to pull it. 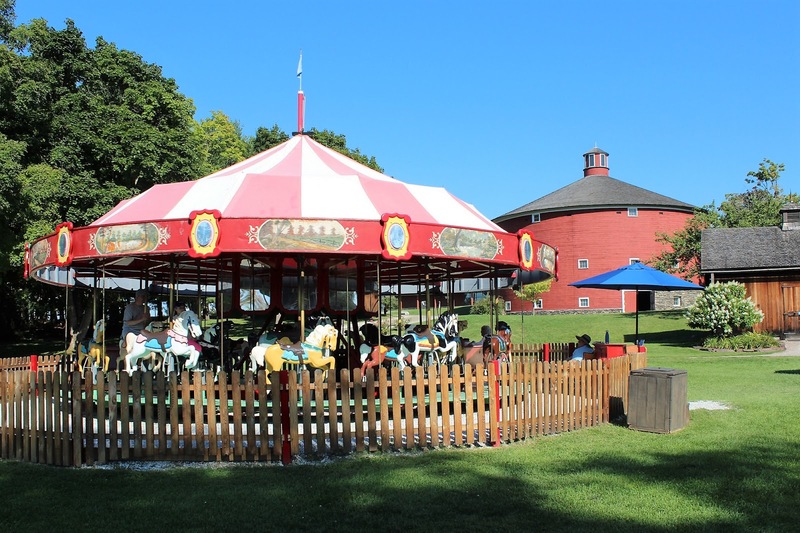 The carousel built by Dentzel in 1902/1903 was purchased by Mrs. Webb in 1950. 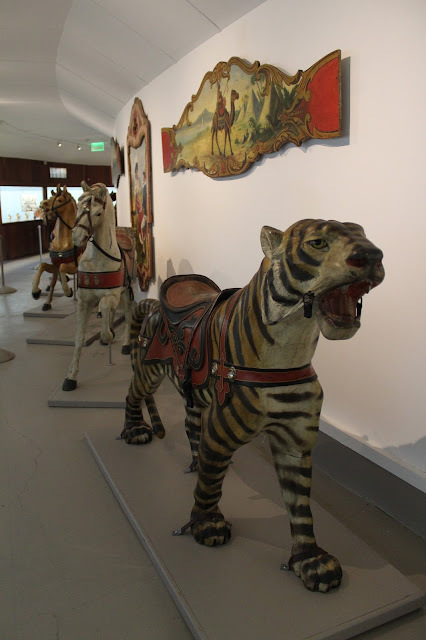 She had planned to have the carousel operating but decided that the animals were so beautiful they would be displayed as art pieces on their own instead. 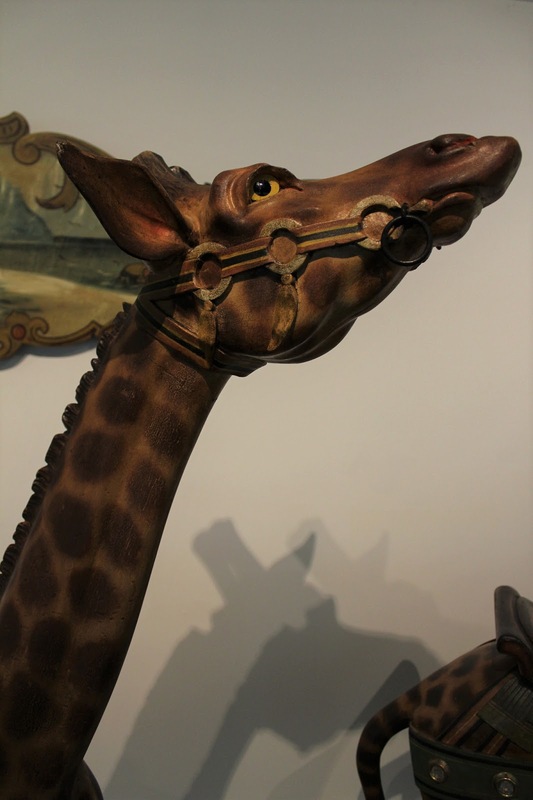 Justifiably so. 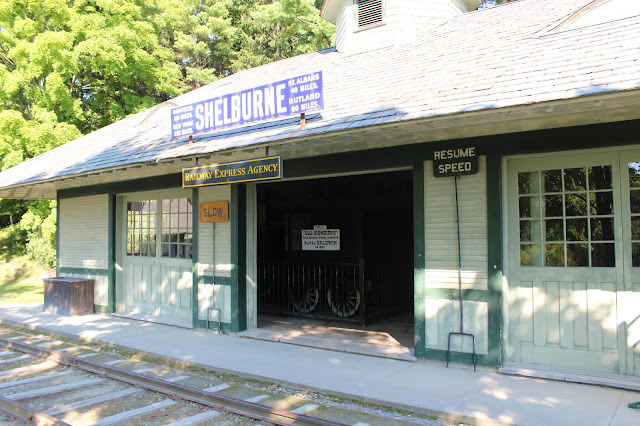 In 1890 railroad entrepreneur Dr. William Seward Webb commissioned construction of a railroad station for Shelburne to serve passengers of the Central Vermont and Rutland Railways. Dr. Webb was the father-in-law of Electra Havemeyer Webb and married to a Vanderbilt. 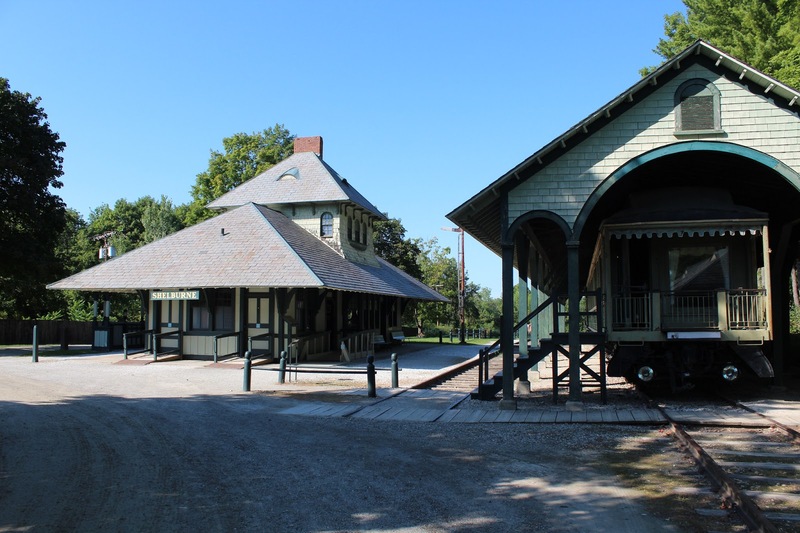 The station was designed by the architect who also designed the Vanderbilt-Webb estate at nearby Shelburne Farms and is in the popular shingle style. 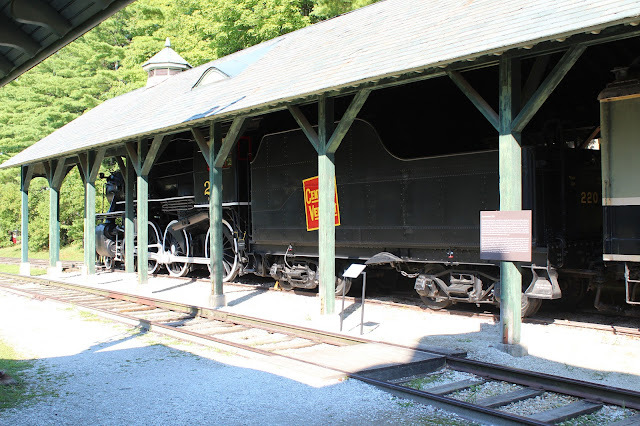 It was moved to its current location at the museum in 1959 and a Freight Shed was built adjacent to it then as well. 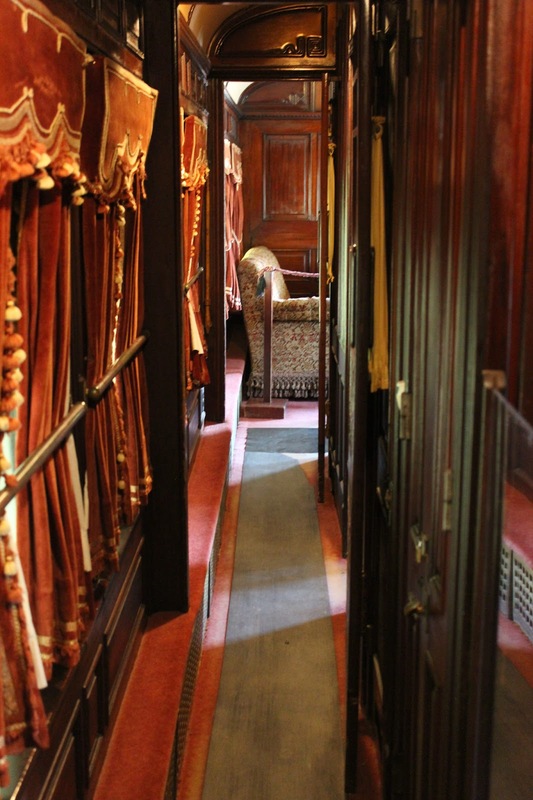 The collection of railway memorabilia and rolling stock includes Rail Locomotive No. 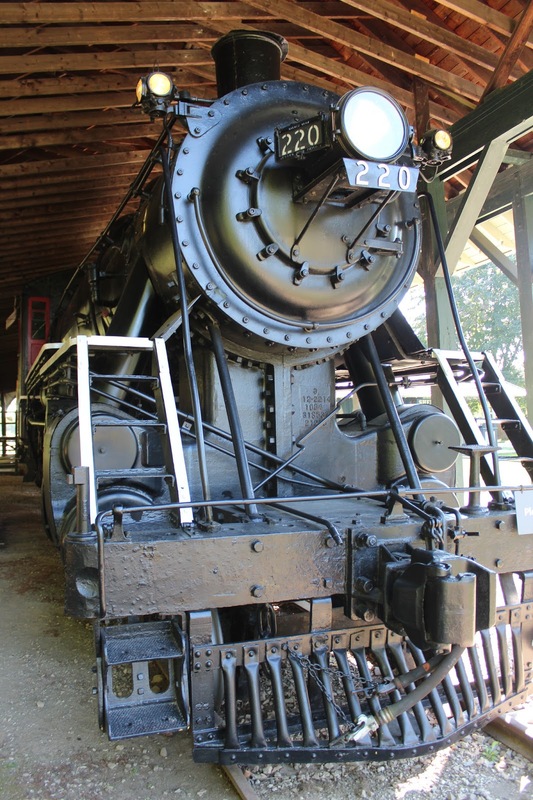 220, built in 1915 by ALCO in Schenectady, New York, and used for freight and passenger service by the Central Vermont Railway. 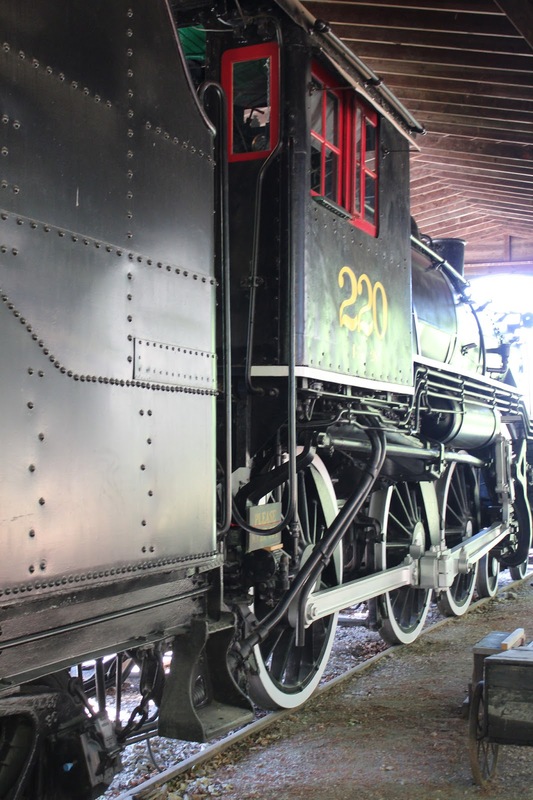 It had a 4-6-0 configuration and was known as "the Locomotive of the Presidents," having hauled special trains for Calvin Coolidge, Herbert Hoover, Franklin Roosevelt and Dwight D. Eisenhower. 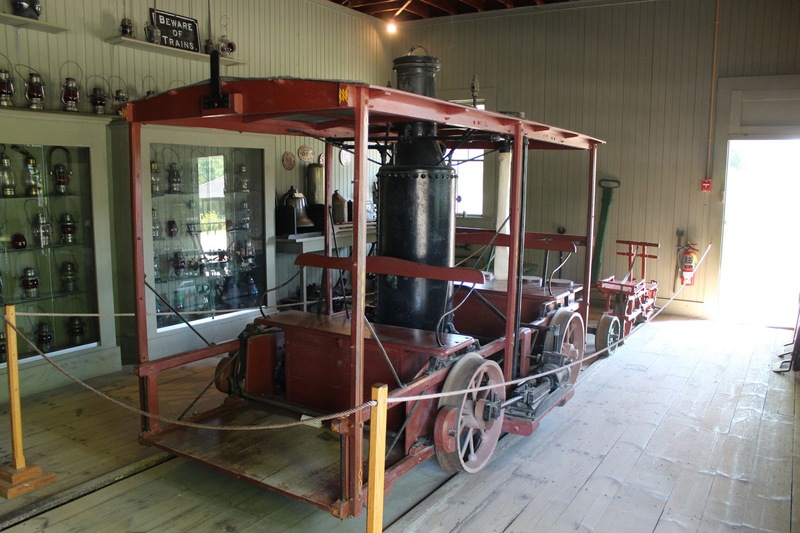 It was retired from service in 1956 and presented to the museum for preservation. 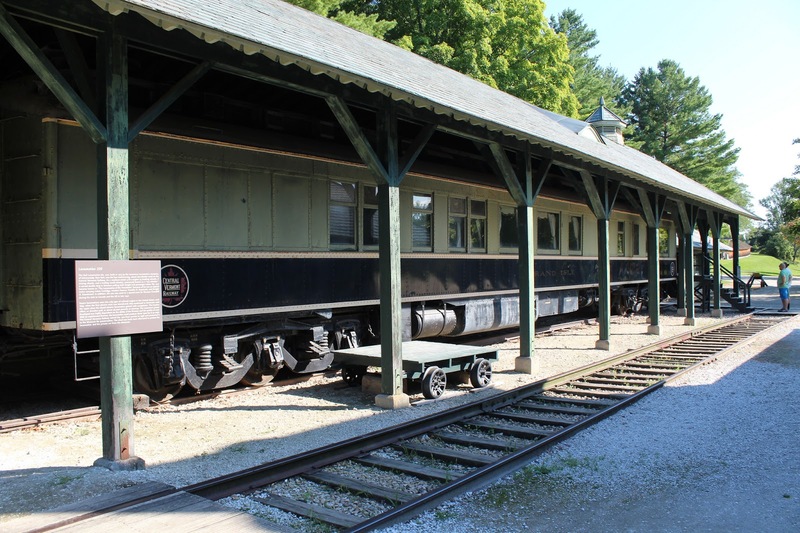 Built in 1899 for Dr. William Seward Webb, the Grand Isle was one of several private railcars used for his commute from Shelburne to New York and other personal travel. 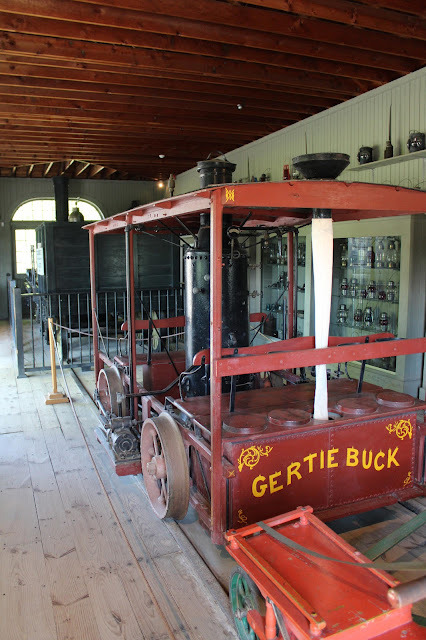 Webb later donated the car to Edward Smith, former Vermont Governor and President of the Vermont Central Railway. 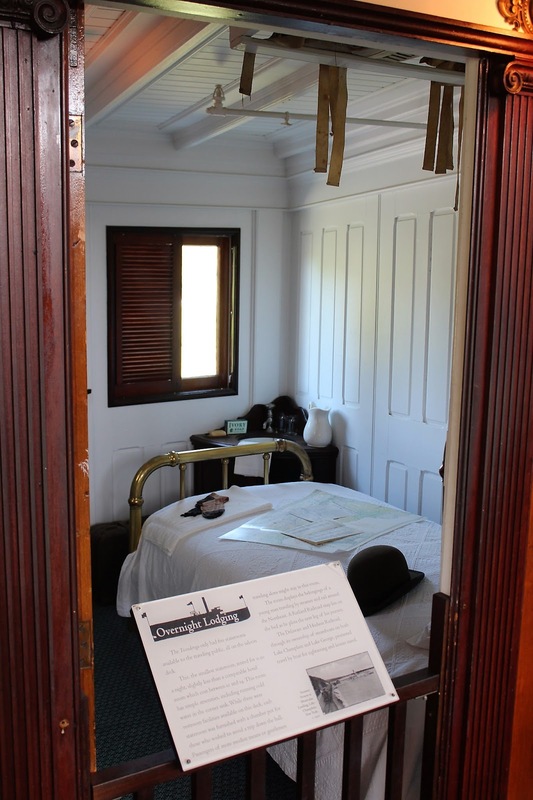 The car’s mahogany-paneled parlor, elegant dining room, staterooms, and plush furnishings typified the private luxury cars that became important symbols of rank to railroad men, business tycoons, and public figures in the final quarter of the 19th century. 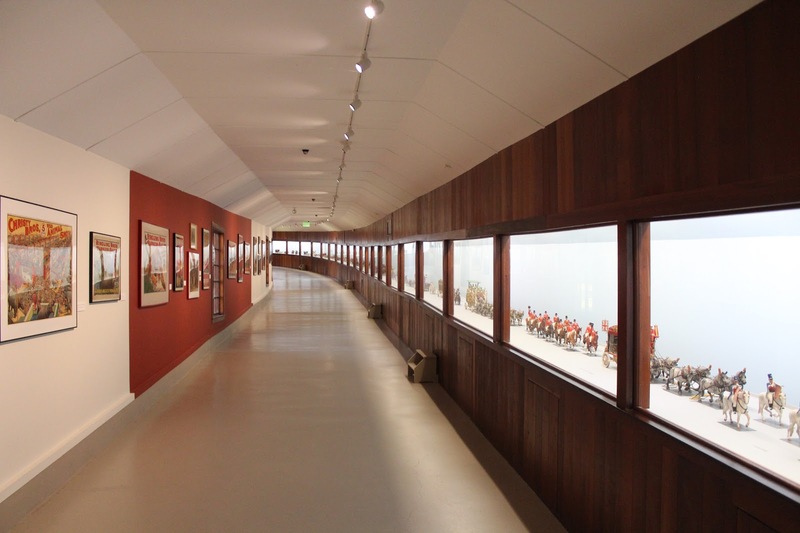 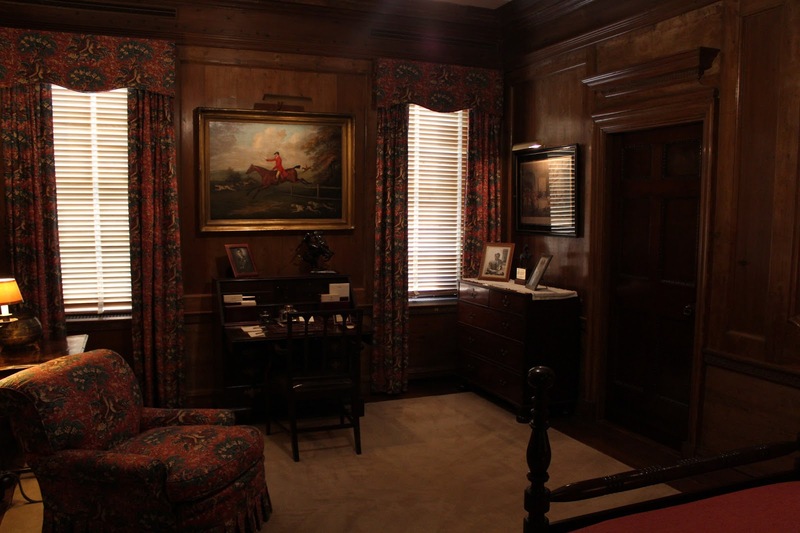 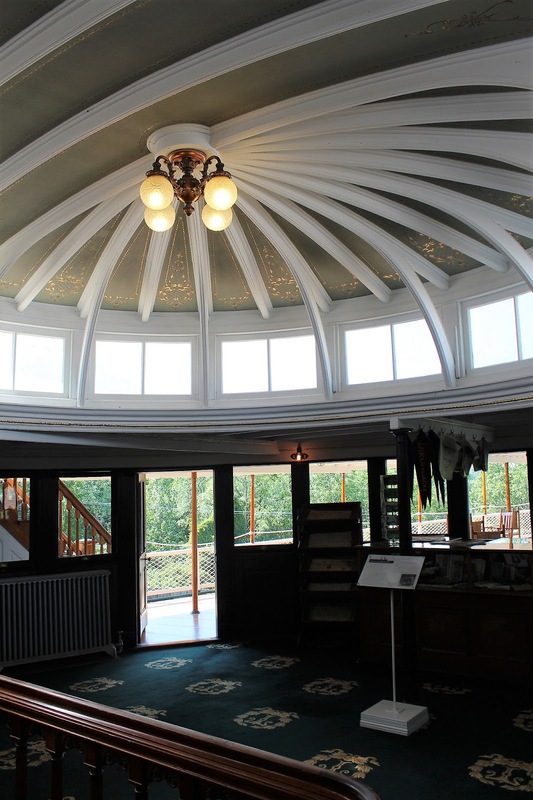 The museum purchased the Grand Isle in 1960 and it was restored to its original splendour. 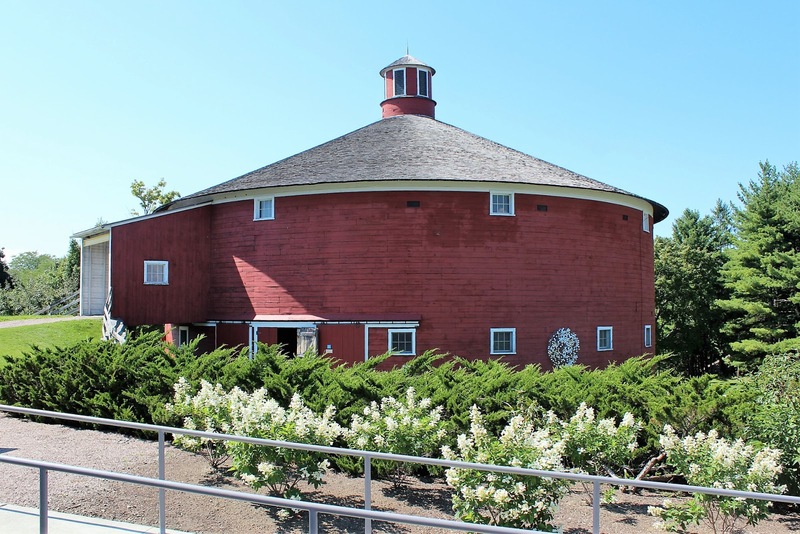 One of the most striking buildings at the Shelburne Museum has to be the Round Barn, constructed by Fred Quimbly in 1901 in East Passumpsic, Vermont. 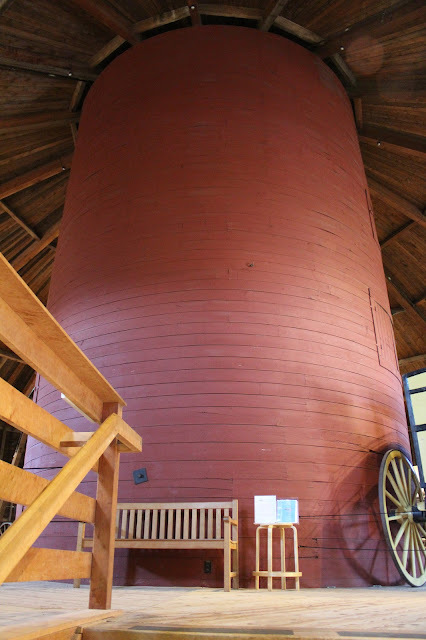 Three stories tall and eighty feet in diameter, it is one of some two dozen built in the state following publication of plans in a national magazine in 1896. 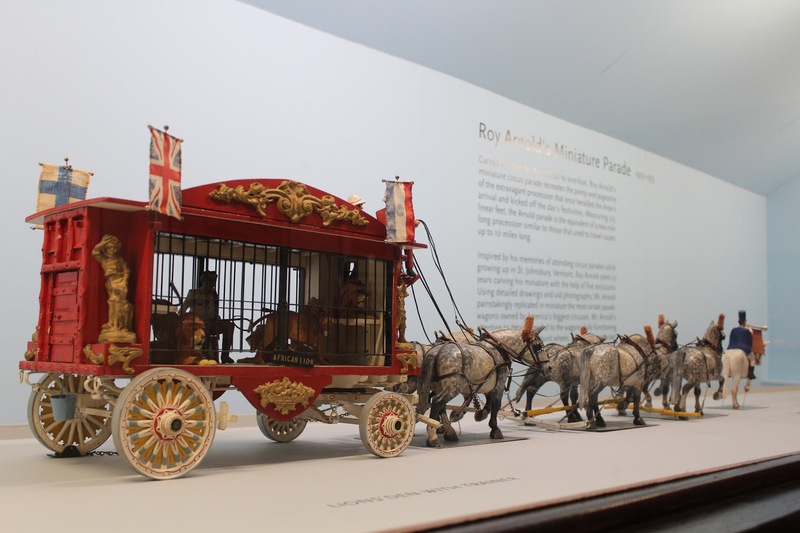 This marked a revival of an idea first implemented by the Shakers in 1826 who saw economy of labour in the design. It has feed chutes in the upper loft for hay and storage for silage in the central silo, around which up to 60 cows could be stachioned, while manure would be dropped through trap doors into the basement for collection. 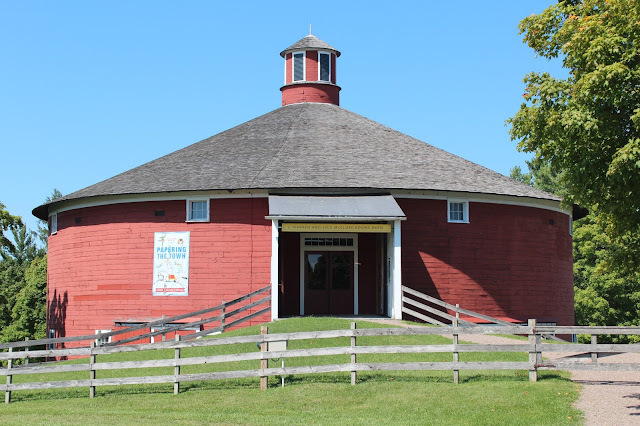 The Round Barn was disassembled and moved to the museum in 1985 and 1986. The central part of the upper silo was actually transported by helicopter to the site. 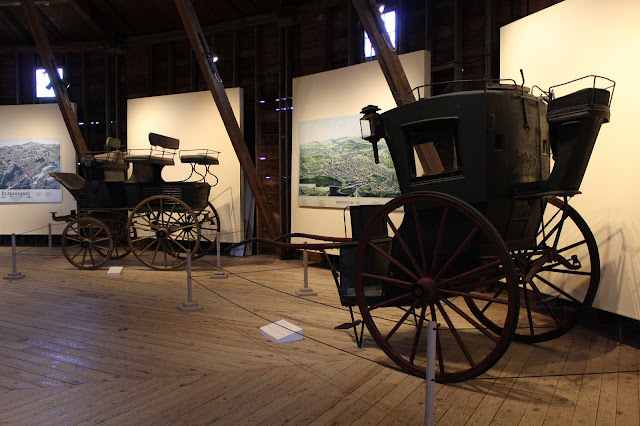 The building is used for display of horse-drawn vehicles, of which the museum boasts nearly 200. 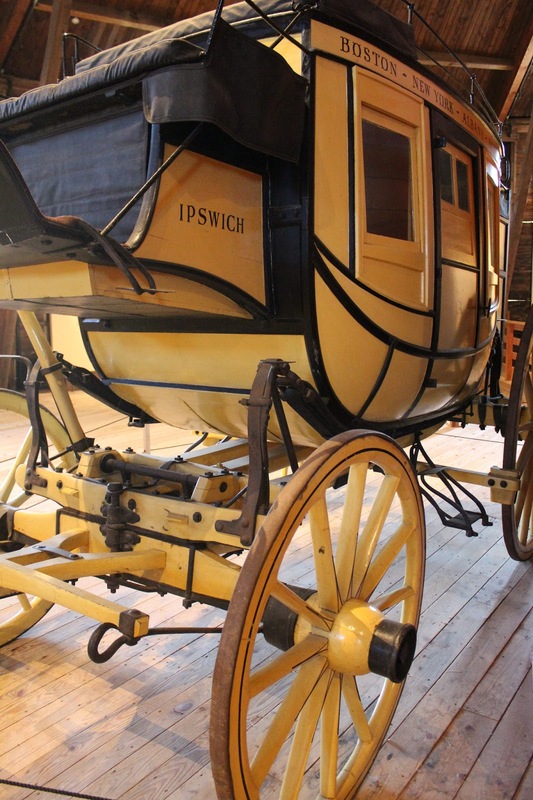 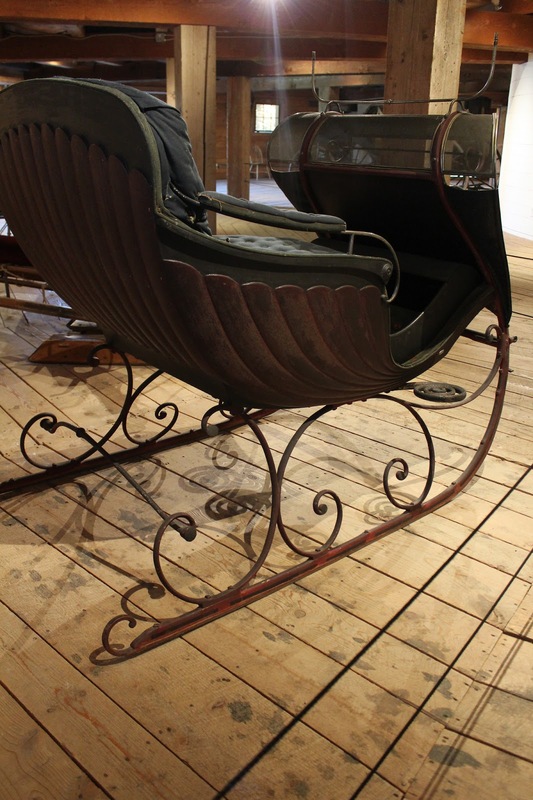 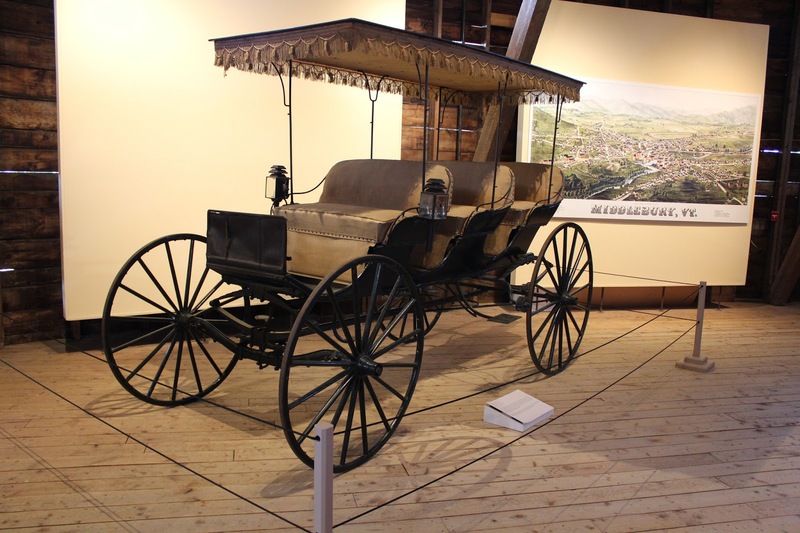 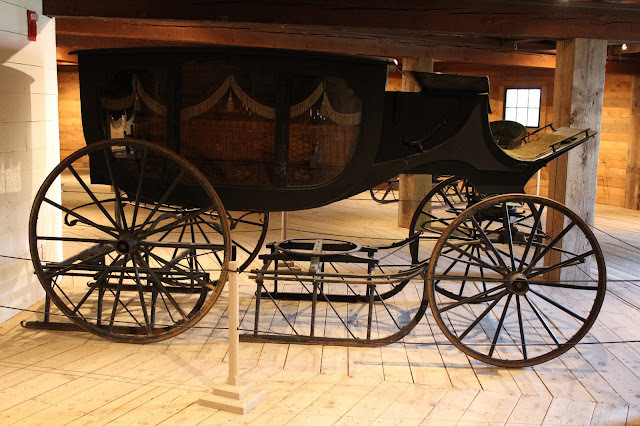 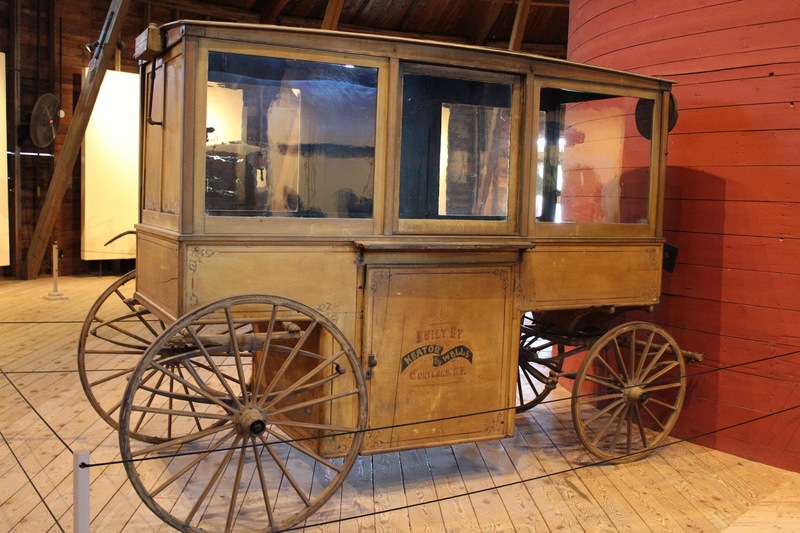 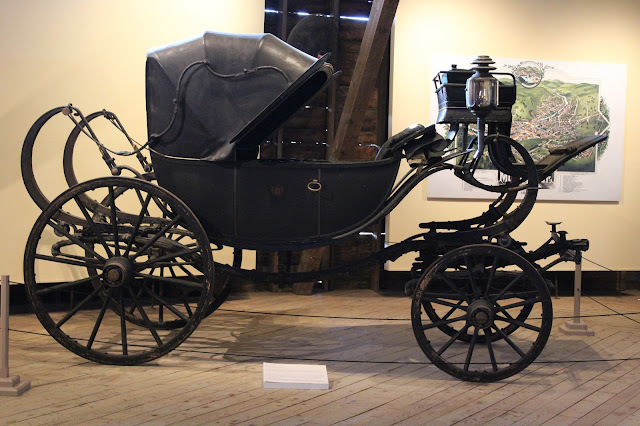 In 1946 Mrs. Webb received a gift of twenty-eight carriages from the estate of her father-in-law, Dr. William Seward Webb, and his wife, and this triggered the Shelburne Museum's birth a year later. 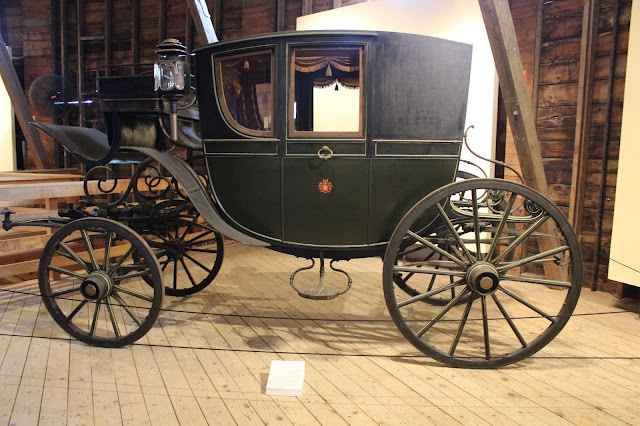 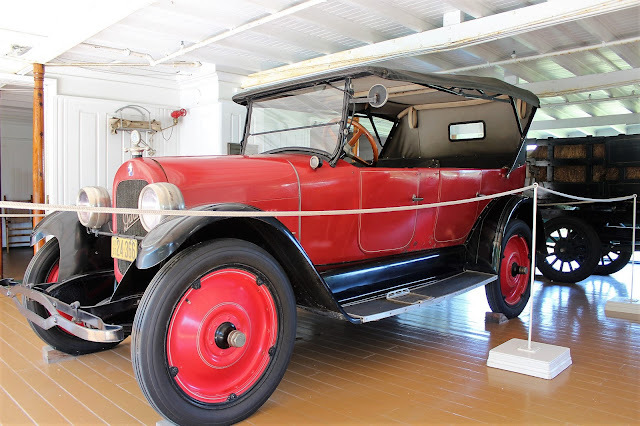 The vehicles would represent some of the finest available in the 1890s by noted builders such as Brewster & Co. of New York, a firm later to become noted custom coachbuilders for prestige autos, with a particular link to Rolls-Royce. 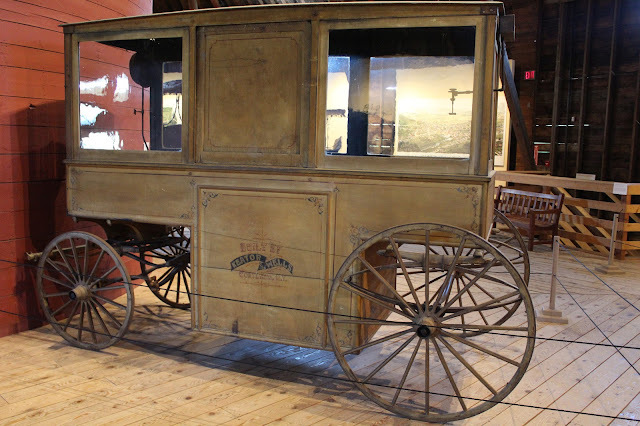 There was far, far more to see at the Shelburne Museum than our afternoon allowed. It is a fascinating (and rather overwhelming) place and definitely worth a return visit. 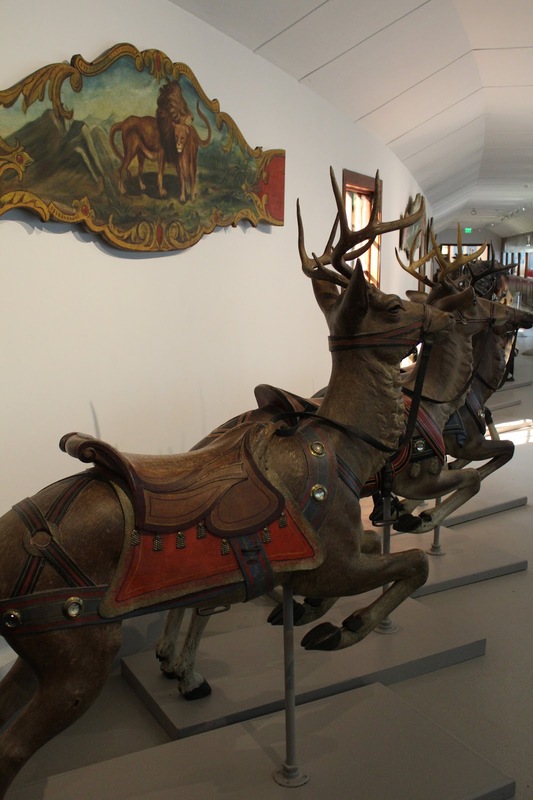 The museum is open year-round but many of the buildings are only open on a seasonal basis. More information may be found here. 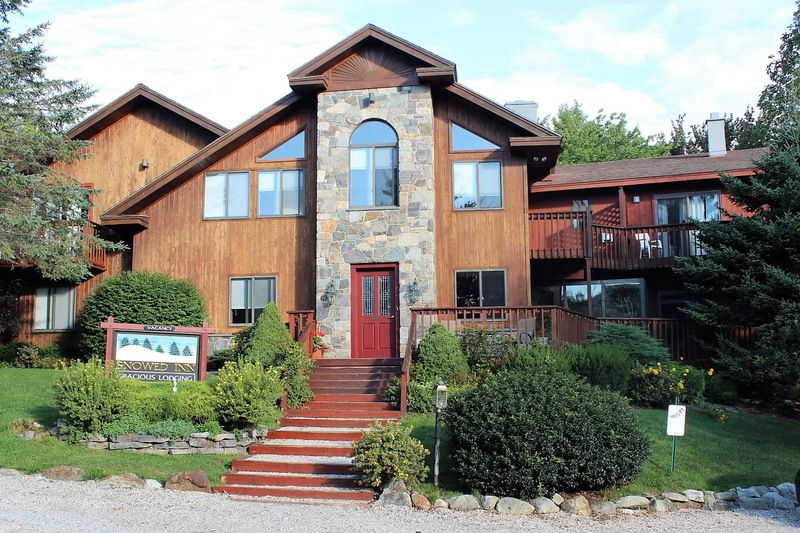 Heading south along Hwy 7, a Vermont scenic route, we made our way to the ski resort of Killington, a 90 minute drive, where we checked into the Snowed Inn and then went to a nearby restaurant, the Foundry at Summit Pond, for a very good dinner. 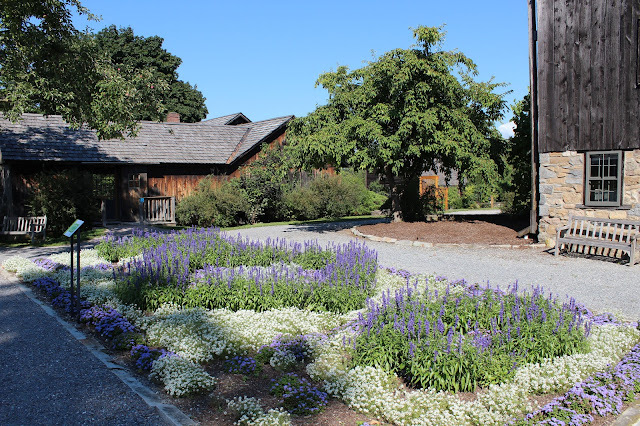 Returning to the inn, our Saturday was complete. 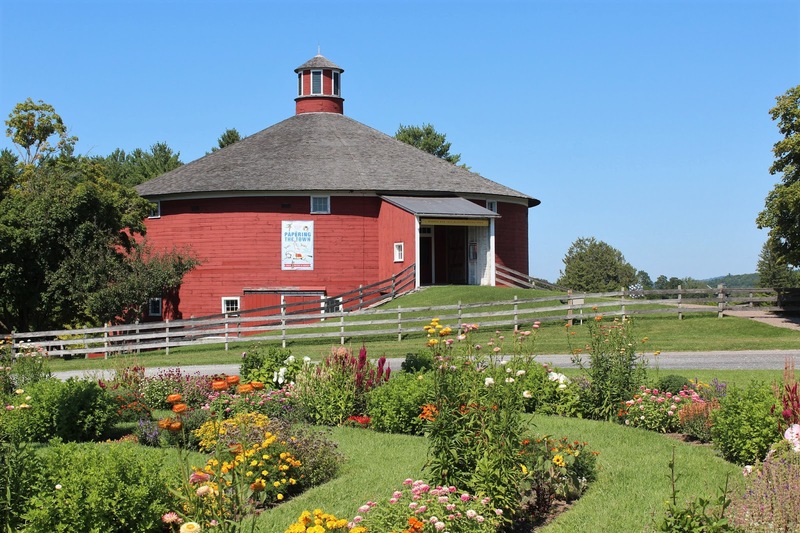 Sunday would be for more scenic byways!